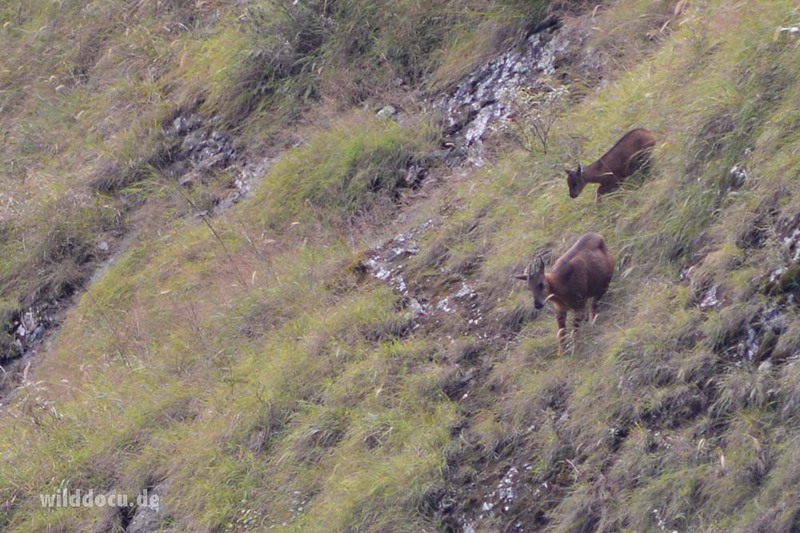 There were two species, which I wanted to see in the Mishmi Hills for my caprinae world project: Mishmi Takin and Red Goral. 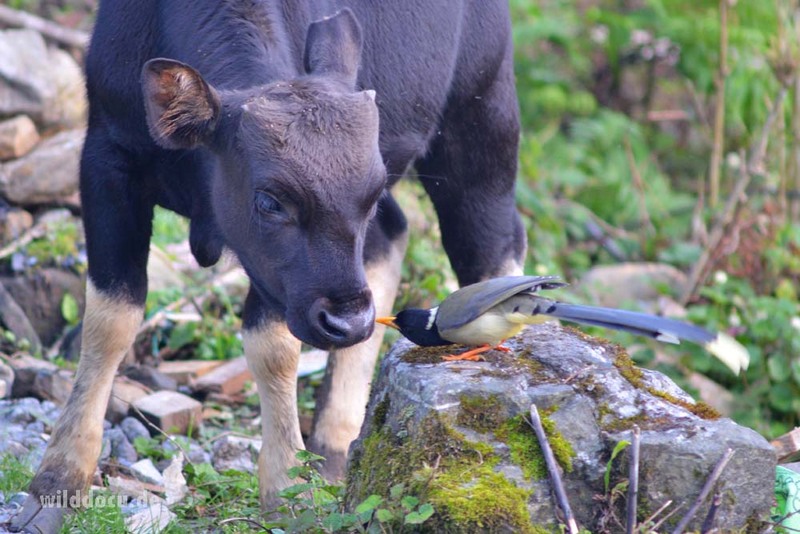 And I was very, very lucky to find them both in the Mishmi Hills – amongst many other mammals and birds. 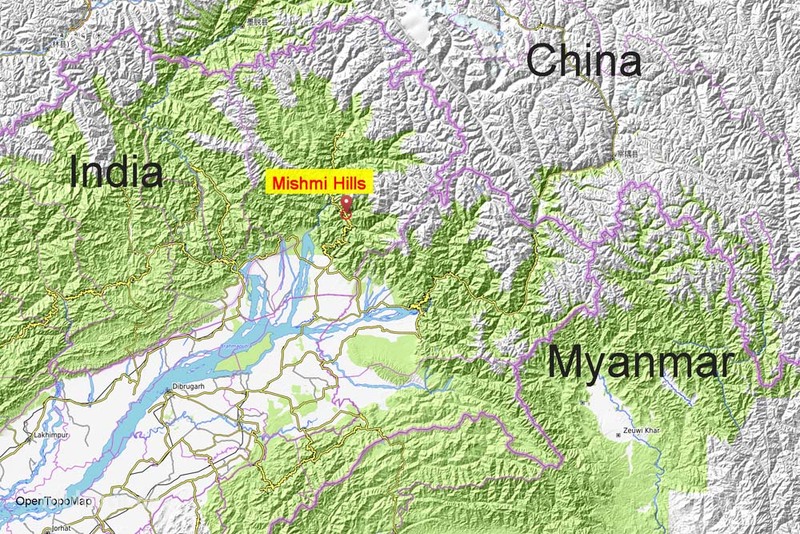 The Mishmi Hills are situated at the junction of the Northeastern Himalaya and the Indo-Burma Ranges. 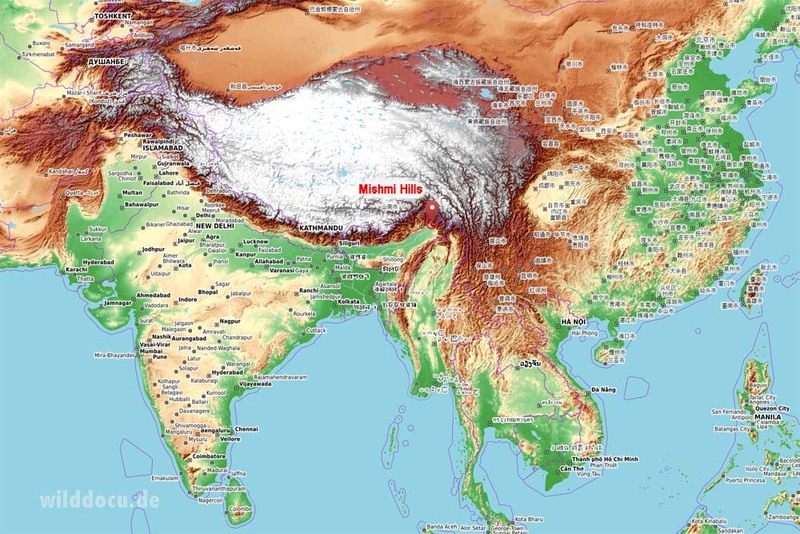 The area is claimed by India and China. 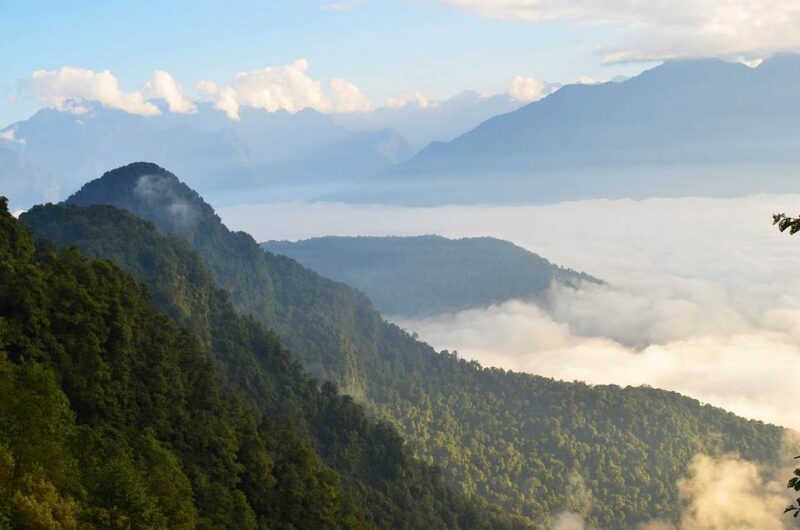 On the Indian side, the Mishmi Hills are located at the northeastern tip of the country, in central Arunachal Pradesh. 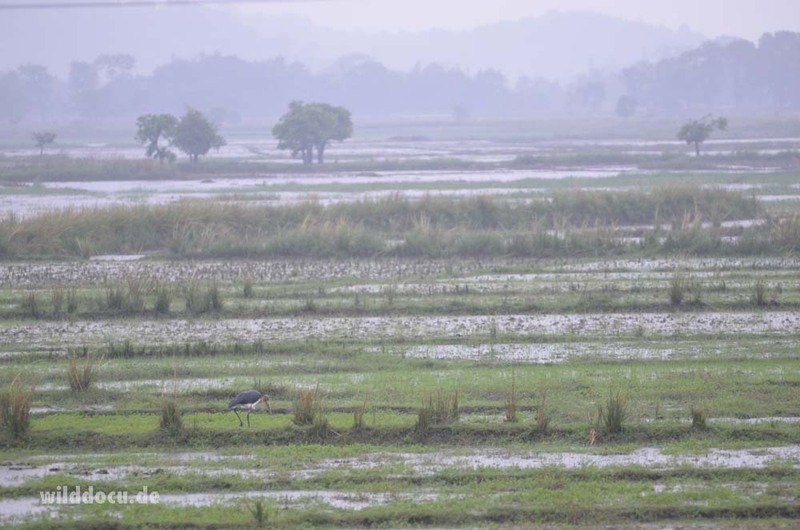 The Mishmi Hills lie within the drainage basin of the Brahmaputra and its tributaries. 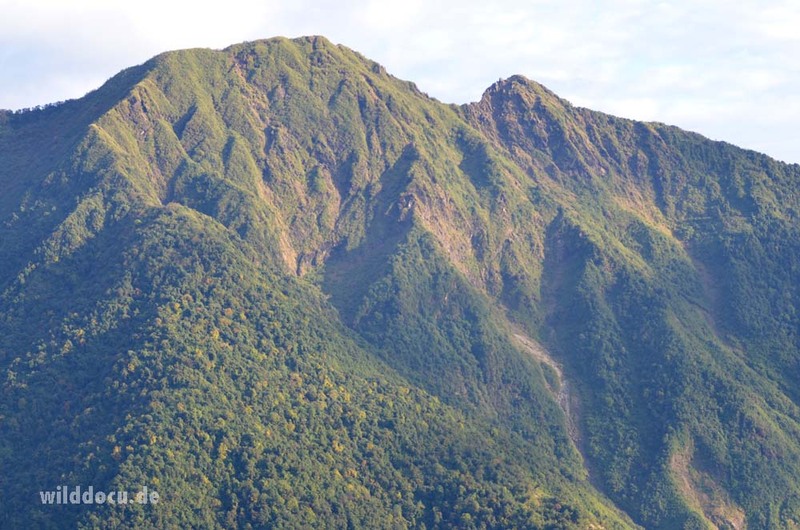 The Mishmi „Hills“ are characterised by steeply sloping mountains. 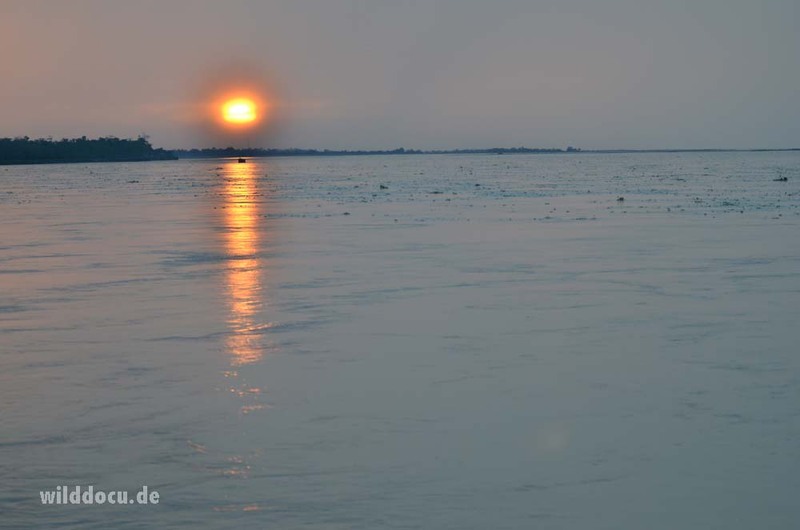 They rise from the flood plains of Brahmaputra tributaries at just 400 m above sea level to reach heights close to the Indian-Chinese border above 5000 m.
The vegetation of the Mishmi Hills is extremely divers with sub-tropical evergreen forests in the lower parts, harbouring wild bananas and tree ferns. As you climb up you find Magnolias, Rhododendron, Bamboo. Hemlock Fir is the most conspicuous tree at Mayodia Pass (2660 m). 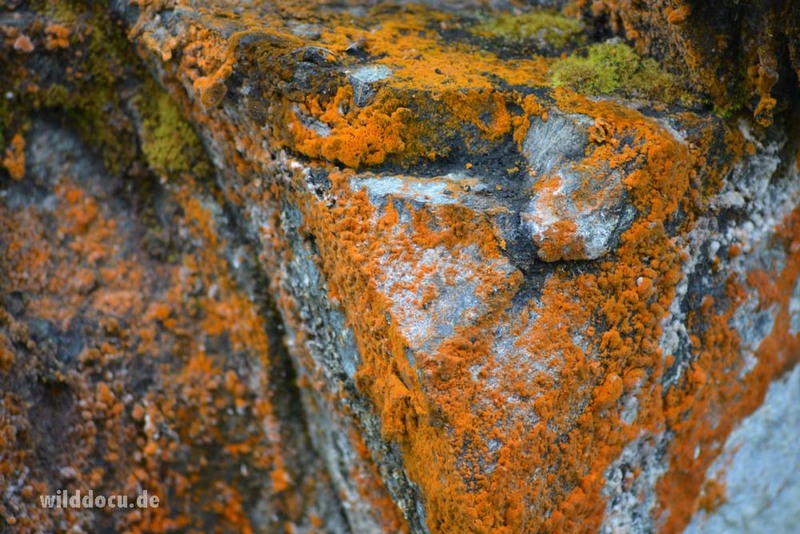 … these lichens intrigue me too. If you look at satellite maps you get the impression that the surrounding ridges, that reach heights of up to 3500 m, lie in the open. In fact it is all covered with bamboo and therefore visibilitiy is low. The alpine range, beyond the bamboo zone I did not reach. 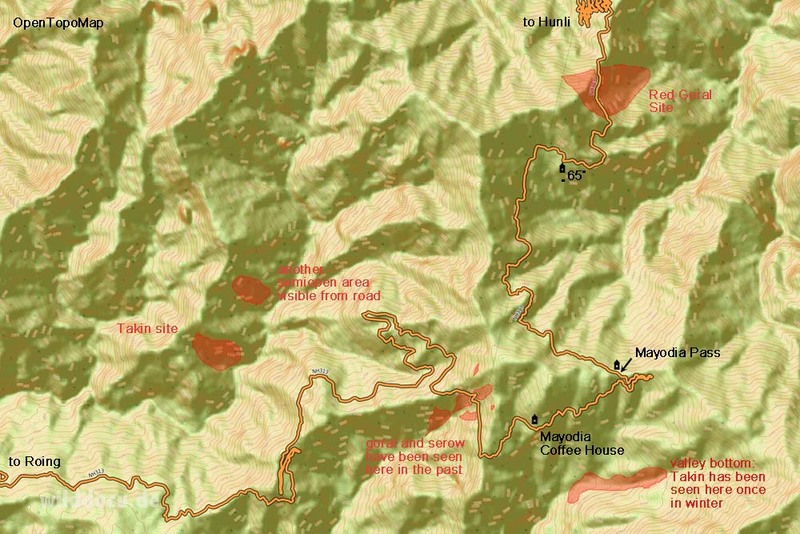 Opposite Mayodia Coffee House: The light green patches above treeline (upper third) are covered with bamboo. The Mishmis are said to harbour around a 100 mammal species. But because of the inaccessiblity of the terrain and the dense vegetation you can only expect to see a fraction of that. Encounters with Tigers, Clouded Leopards or Serows are purely accidental. 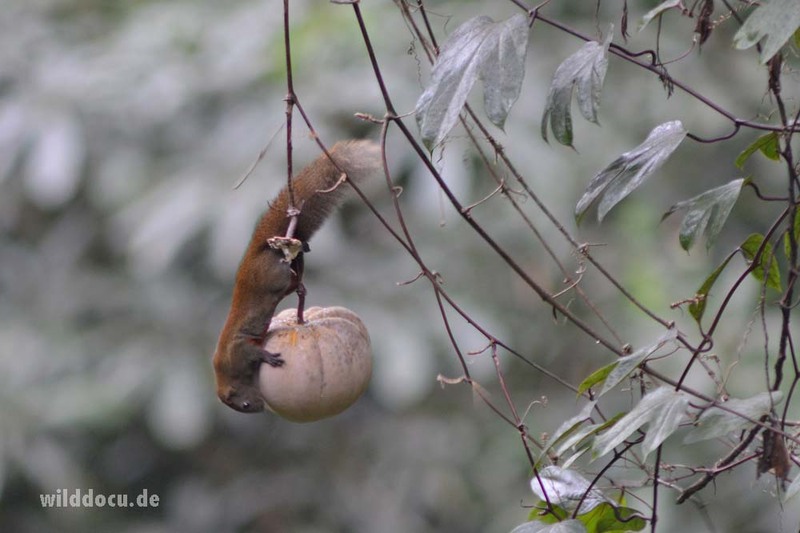 Some of the species that are more likely to be found, are the following from my trip list: Hoolock Gibbon, Assamese Macaque, Yellow-Throated Marten, Pallas’s Squirrel, Grey-headed Giant Flying Squirrel, Red Goral, Mishmi-Takin. 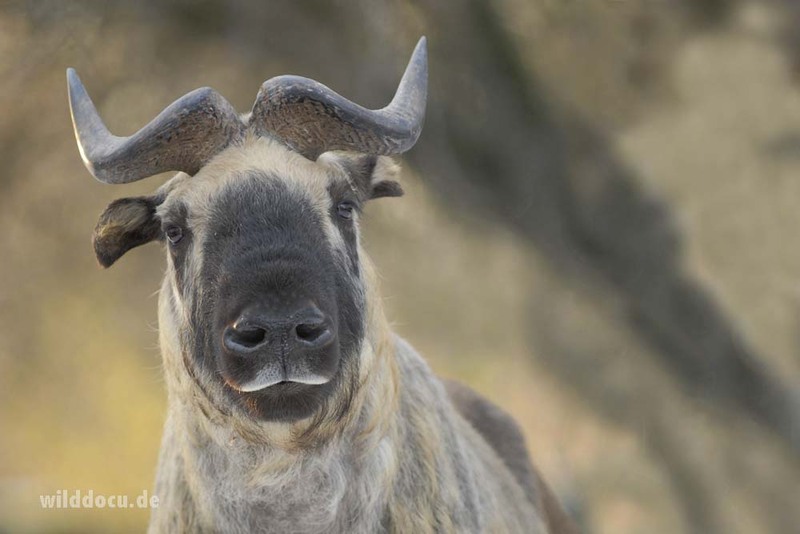 For me the most intriguing species of the area is the Mishmi Takin (Budorcas taxicolor taxicolor), which – despite its name – is not an endemit of the Mishmi Hills. Its range extends well into China. The species is well represented in 32 Zoos in Europe and Russia (ISIS, pers. inquiry 2017-11), but very few observations from the wild are documented. I wanted to give it a try in the Mishmis. Another elusive species is the Red Goral. 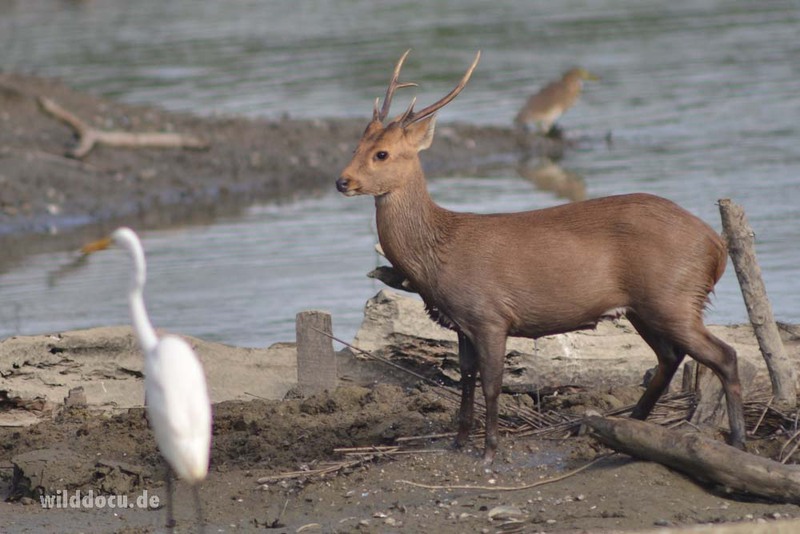 I have found only three places, where this species has been seen in recent years: Hkakabo Razi National Park in the North of Myanmar – a hardly accessible place. Yarlung Tsangpo Grand Canyon, Tibet, China and the Mishmi Hills. 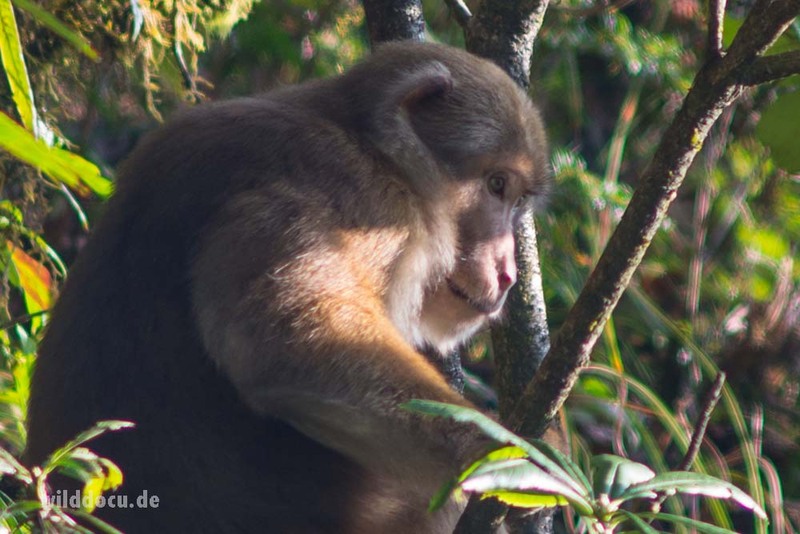 Other mammals of interest: The White-Cheeked Macaque (Macaca leucogenys) was first discovered and described in 2015 for the Mêdog County, Tibet. 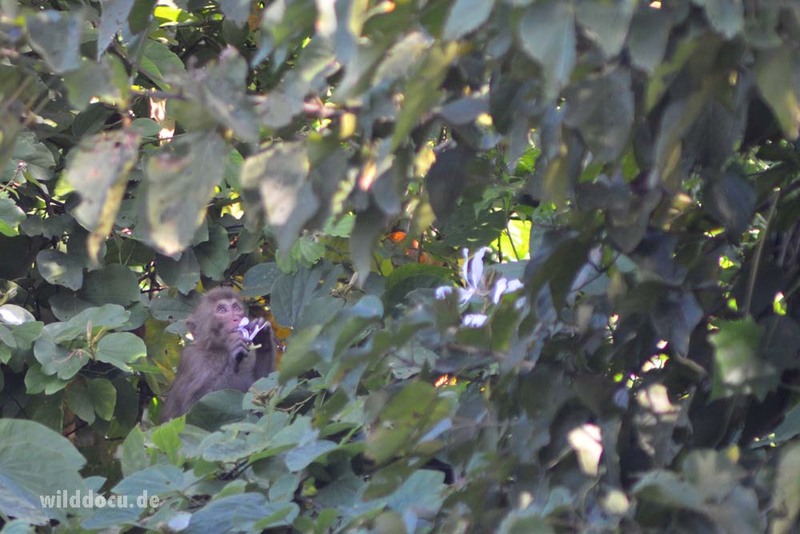 In April 2016, a group of wildlife photographers and biologists spotted a White-Cheeked Macaque in Arunachal Pradesh, Anjaw district (southeast of the Mishmi Hills). 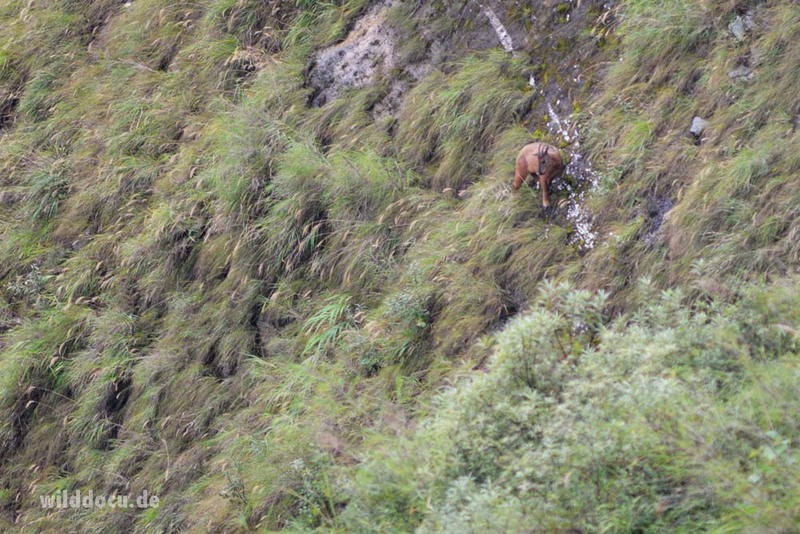 Guides I met on this trip claim to have seen this species in the Mishmi Hills too. 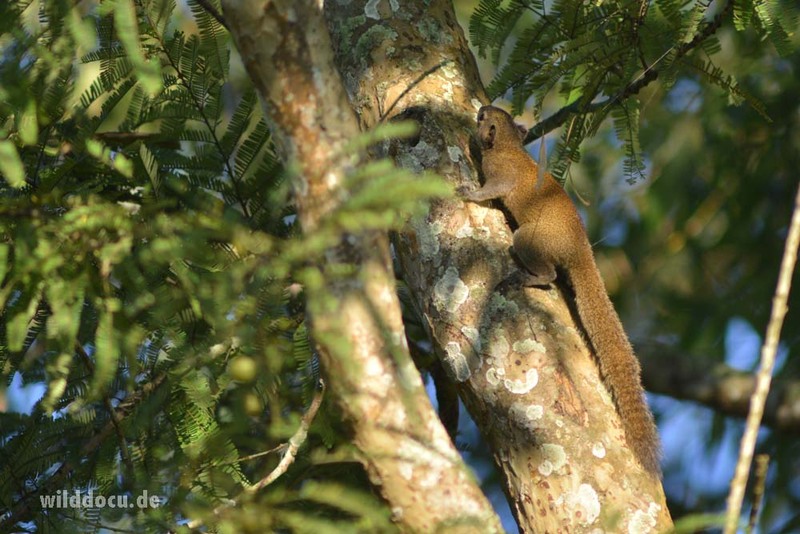 An endemit of the Mishmi Hills and neighbouring areas in Arunachal Pradesh is the Mishmi Hills Giant Flying Squirrel (Petaurista mishmiensis), another species that has been just recently discovered (Choudhury, 2009). 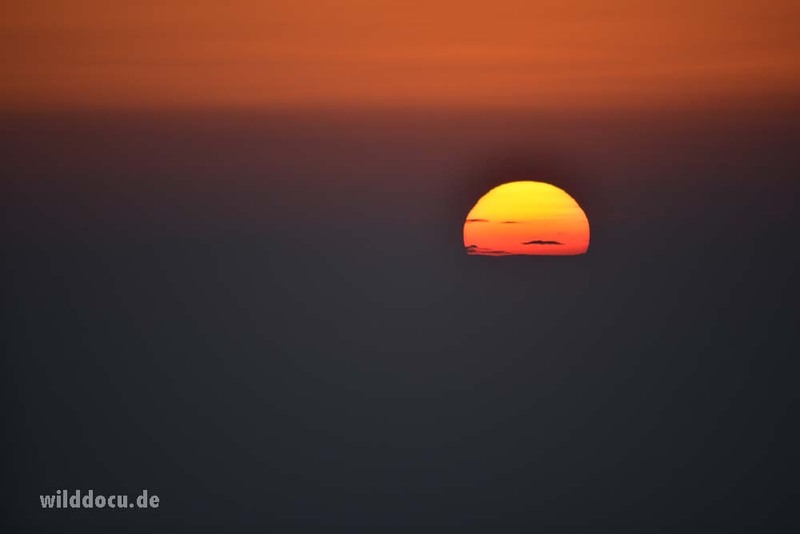 It occurs at elevations from 600 to 1600 meters. I photographed two Petaurista squirrels near Mayodia Pass (around 2500 m). They turned out to be Grey-headed Giant Flying (Petaurista caniceps). Look here for a comparison of Petaurista species. 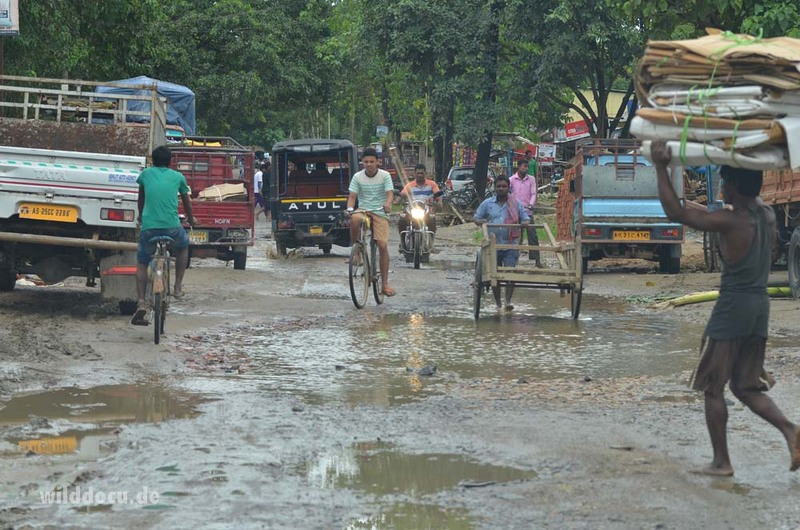 The postmonsoon-season in the Northeast is said to start in November. And in fact on my arrival it still rains heavily. But the following days I find out, that it can be actually very nice to travel and photograph in the rain. There is no dust on the roads, the smell is nice and being wet doesn’t mean you are cold. As to be expected the weather gradually changes to the better. Even in the mountains temperatures stay as high as 25 C° during the day. In the evenings and at night though it cools down. One morning I measure 9 C° in my room. But with enough blankets this is no problem. Dustfree traveling: The monsoon has its advantages. 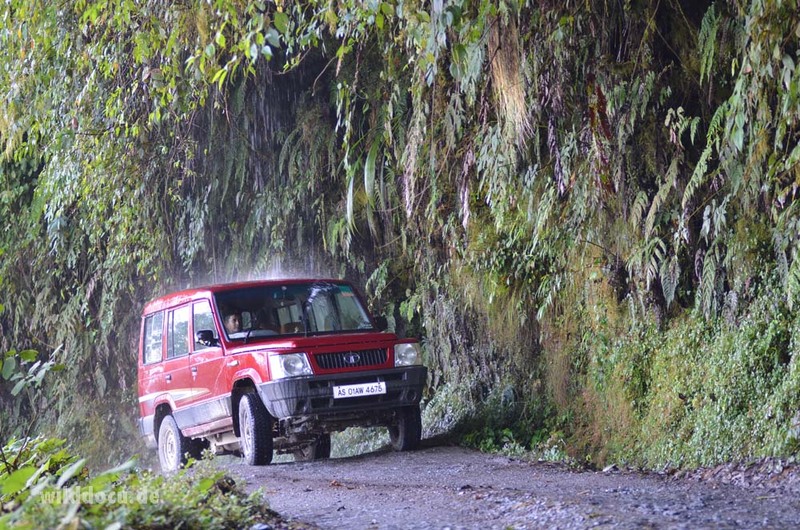 Since having travelled through the Mishmi Hills I know: 4-wheel drive is overrated. This „Tata Sumo Victa“ with rear-wheel drive did a great job. Very often the road side appears like the décor of a botanical garden. 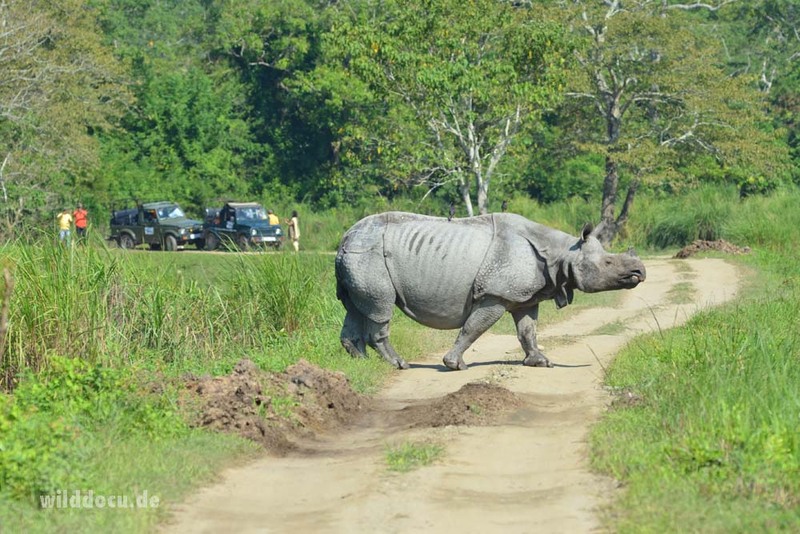 The first stretch is rather short: just 3 hours from the airport in Guwahati to Pobitora Nationalpark. I like Pobitora for being able to observe Rhinos afoot. A car is not necessary, you walk on a damm, which the Rhinos stand clear of – at least during the day. 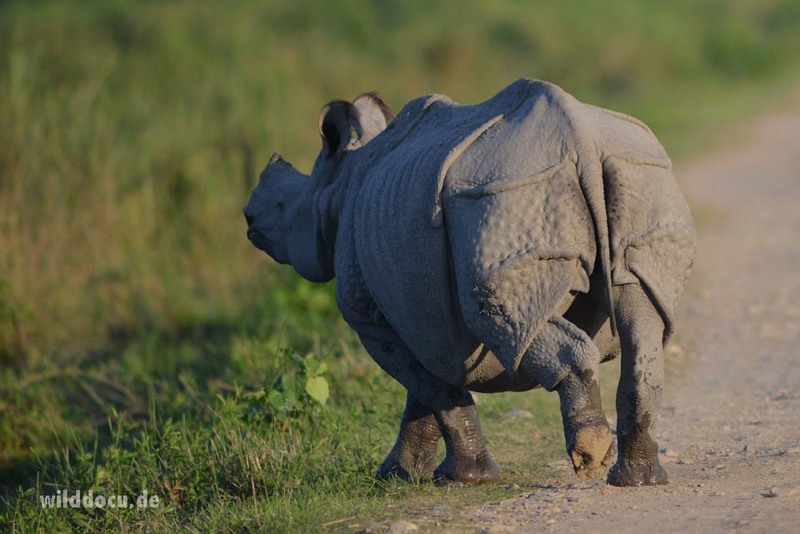 On the second day we reach Kaziranga NP within 6 hours. The driving on the third day is even longer, 7 hours, to reach Maguri Bill in the afternoon. The third stretch from Maguri Bill to Roing is again short: 3 hours. 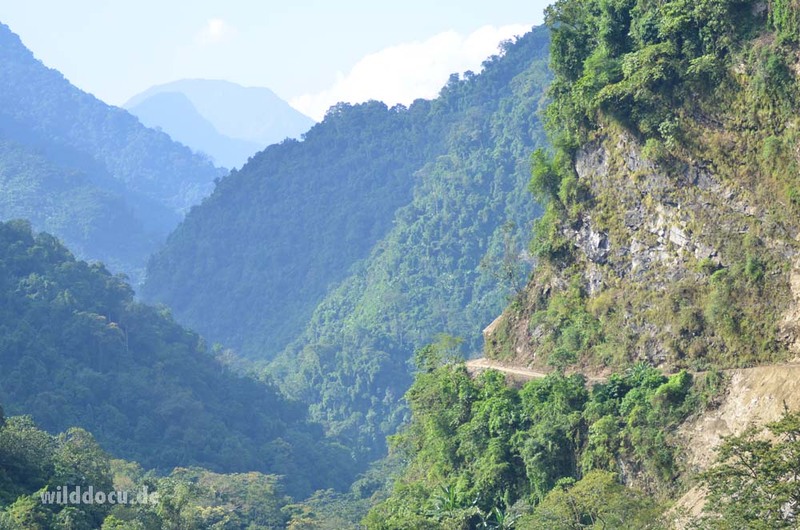 There is currently just one way leading into the Mishmi Hills, the 222 km long Roing-Anini-Road with no continuation into China. After 50 km one crosses Mayodia-Pass (also spelled Mayudia) at 2660 m. In recent years the area before and around the pass has been the major destination for bird watchers. I have read or heard only of a few vistiors who have come to the area with the main focus of watching mammals. 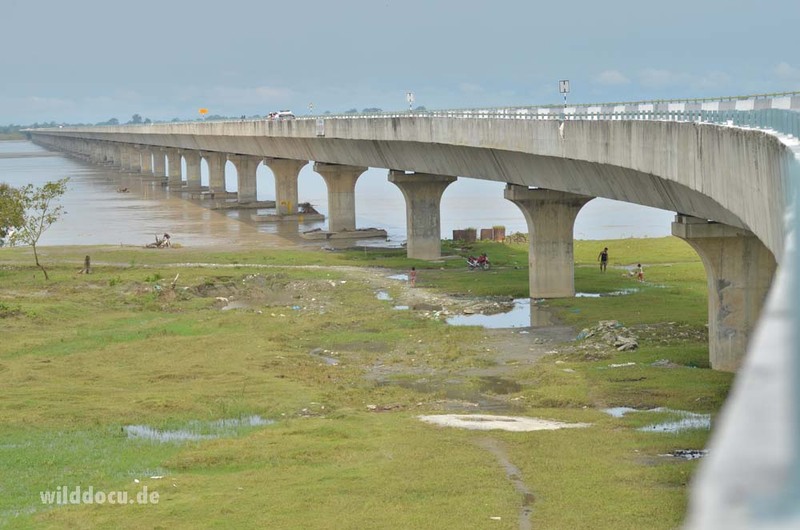 The Dhola-Sadia bridge – India’s biggest – opened 2017. It is said to save you several hours travel time. But: It is also an important piece of the puzzle making the Northeast of India more accessible. 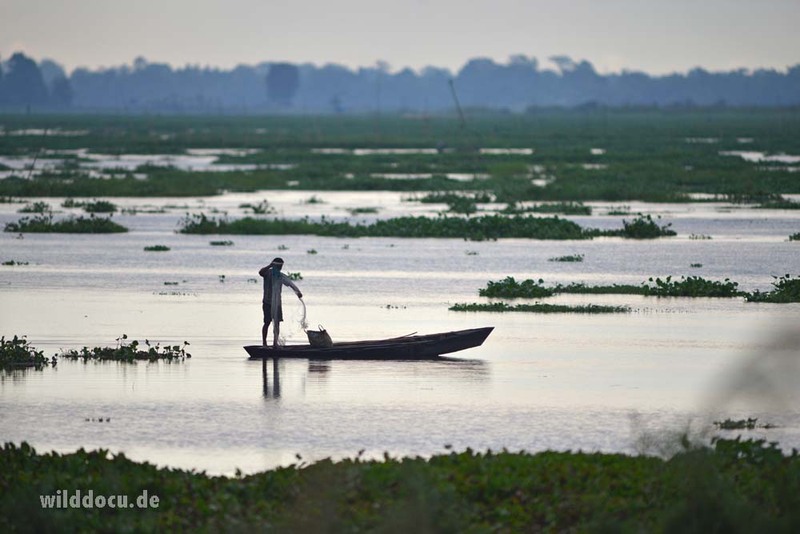 The planners in Delhi want to construct 160 dams in the area. After Mayodia Pass the road leads down to the Ithun River. Just above the river at about 600 m one comes through the village of Hunli, where I spent one night. After Hunli the road follows the Ithun River Valley. From Hunli it’s another 140 km to the last village, Anini. Because of road constructions, temporarily stoppages and unreasonable road conditions I did not dare to drive much beyond Hunli. 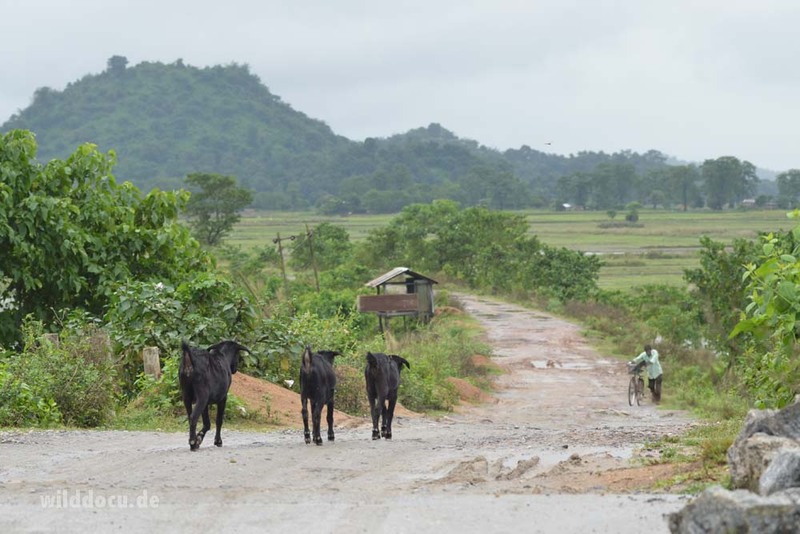 The time within the Mishmi Hills is mainly spent driving with open windows to listen and look for birds and mammals, walking the sparsely frequented road or waiting and scanning the few open slopes. 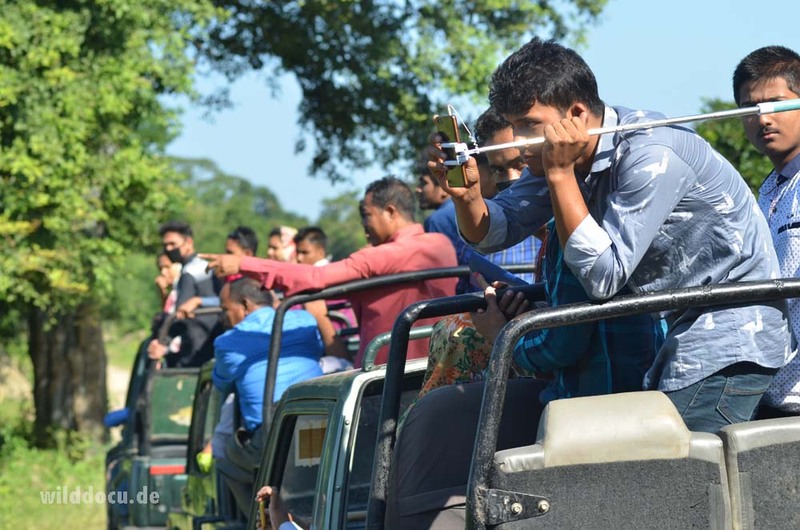 At the end of the trip I spend two full days at Kaziranga Nationalpark to go on Safari and relax from the days and nights at the Mishmis without much sleep. No, I am not a giant (183). The others are just smaller. On the way in and out I stay at lodges and „eco camps“, which can suffice my claim to be surrounded by nature and wildlife. 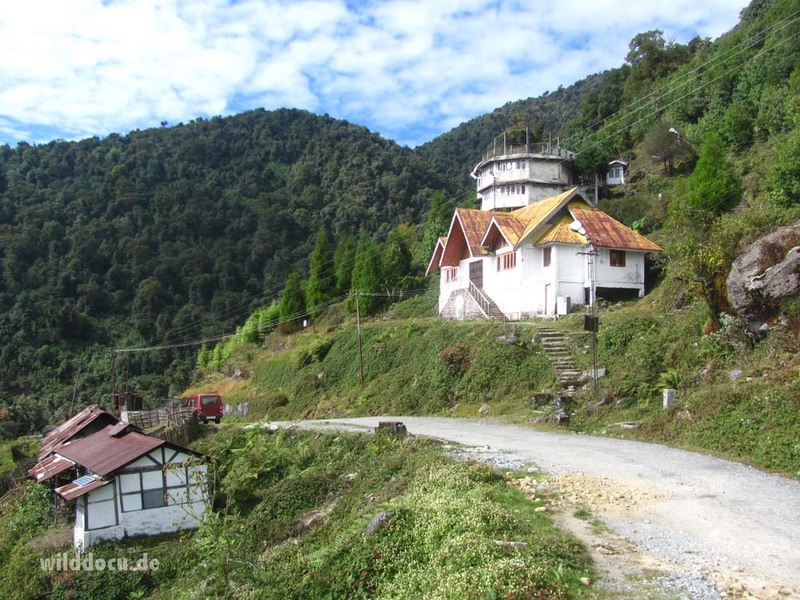 In the Mishmi Hills your only option around Mayodia Pass is the Mayodia Coffee House (at 2430 m ASL). The Coffee House is actually two governmental buildings. When you google the place you find entries saying „don’t stay at the coffee house“. Infact the place is a bit squalid. But the view from the accessible roof is / can be breathtaking. The caretaker, who lives in a hut below, is very friendly and a good cook too. Mayodia Coffee House to the right. Power. A real problem can be – if you are not prepared -, that electricity is not guaranteed (I usually carry along enough batteries for my cameras and flashlights, but I do depend on a socket for my laptop). For some nights I am the only guest and have no power. 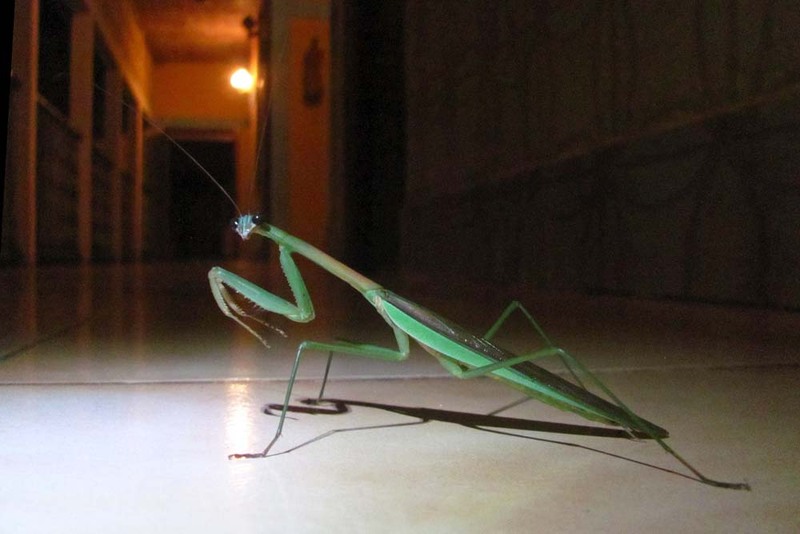 On two nights there is an Indian birding group in the neighbouring building. They use a generator and kindly let me charge my batteries. But it turns out that the loading process with this generator is very slow – too slow to charge my laptop batteries fully in one evening. After having made first experiences with leeches last year, I come with leech socks this time. As a matter of fact you are attacked by leeches as soon as you stand on the grass verge along the road. But it turns out that wearing leech socks at 25 °C – and wearing meant strangling my thighs to prevent the socks from slipping down – is more uncomfortable, than going barefoot in my boots and flipping leeches off my boots as soon as standing on firm ground again. 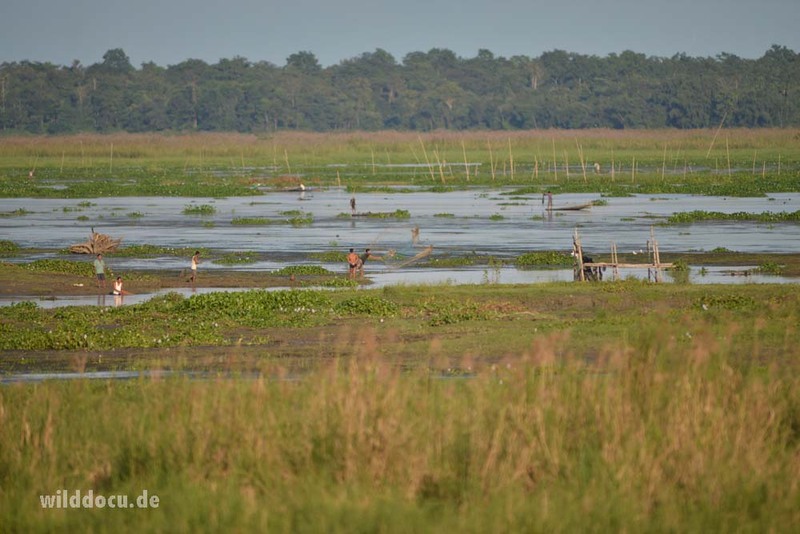 I arrive early in the afternoon at Guwahati Airport and travel another three hours by car (48 km) and eventually arrive at Maibong Resort on the edge of Pobitora Wildlife Refuge. 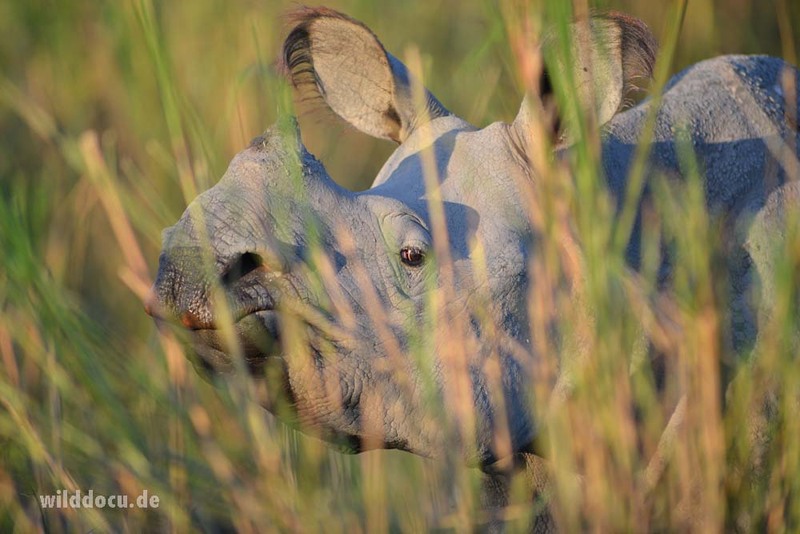 Reportedly Pobitora Wildlife Sanctuary has the densest population of the Great One-Horned Rhinoceros in the world: almost 100 animals per 38.8 square kilometres – though only 16 km2 is effective Rhino habitat. 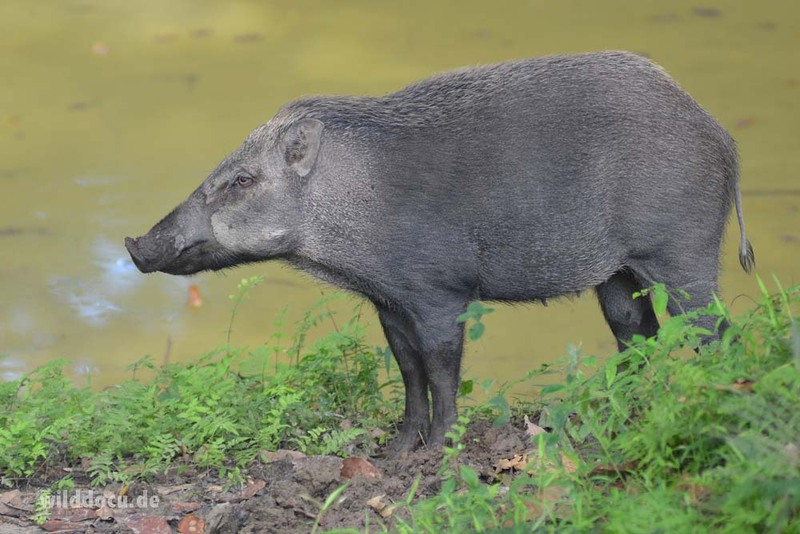 Besides rhinoceros other reported animals are Leopard, Wild Boar, Barking Deer and Wild Buffalo. I had made a reservation with Nripen Nath, the owner of Maibong Resort. I find the grounds very nice, and the food is great too. We drive along Pobitora Road. 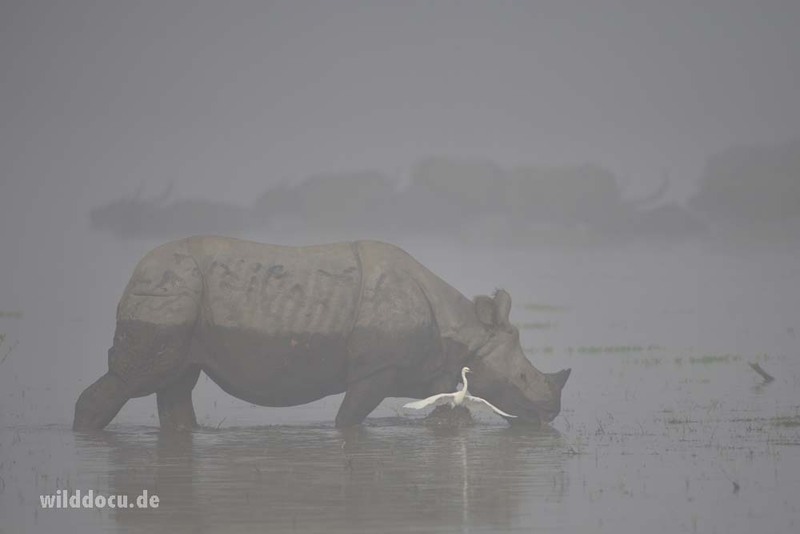 Rhino is there, Buffalo is there, but it is too wet and windy to make good observations. A lonel Wild Buffalo: A local warned me of him. But he stayed put. These Rhinos seemed to take notice of the Whistling Ducks around them. 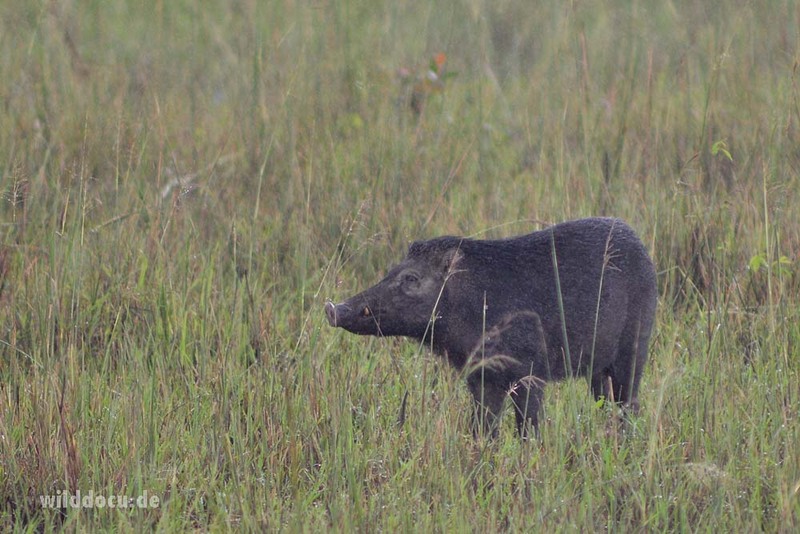 A lonely Wild Boar shares its habitat with the rhinos and buffalos at Pobitora. 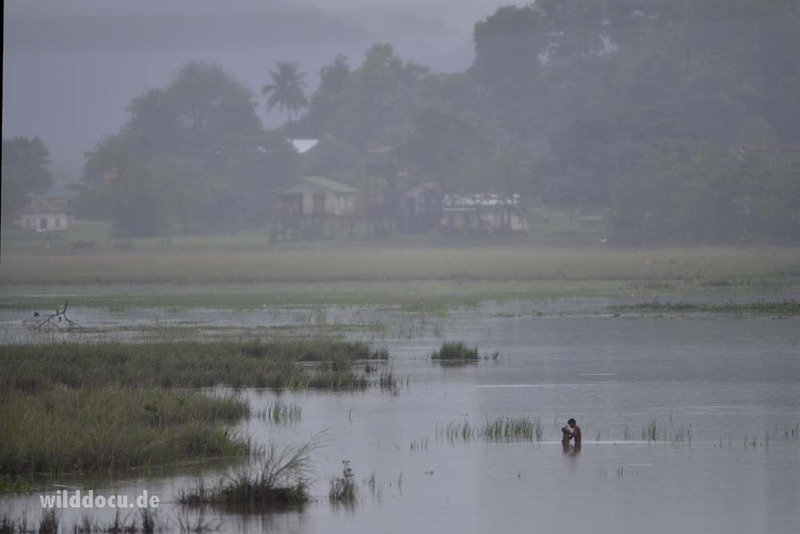 Fisherman at Pobitora: My impression is that the local people benefit from the nature reserve. 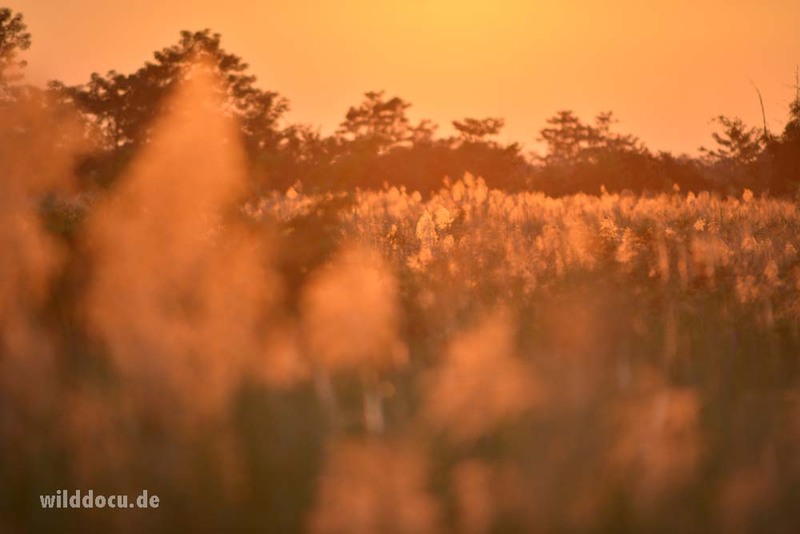 The area generates biomass that the locals can harvest at the fringes of the reserve. I start at 5 am and plan on walking down the road that we drove last night. But Nripen meets me and tells me about a Rhino that has moved from the park into the adjacent fields. He offers me to drive me to the site. Upon our arrival the villagers are still on the road, but the rhino is gone. I feel sorry for the people, who can’t do much about their fields. But of course the rhino has it’s right to live too. We drive back to the resort, where Nripen has promised me to see Oriental Pied Hornbill between 5 and 6 am, if the rain ceases. The rain has stopped and sure enough the big birds arrive and feast on figs in the trees around the resort’s pond. Many more birds are to be seen in the area, like Yellow-Footed Green Pigeon, Lineated and Coppersmith Barbet, Chestnut-Tailed Starlings, Common Tailerbird, Little Spiderhunter. At the end of the village you get good views into the swamp area of the park. 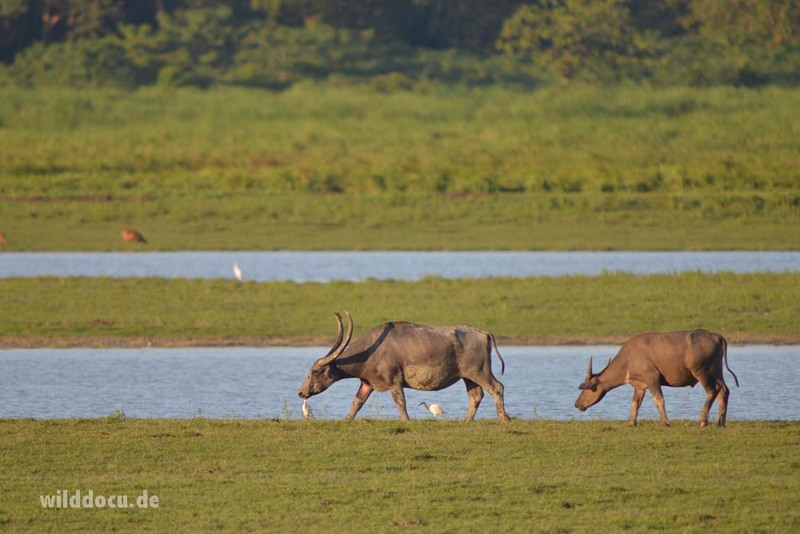 We count 10 Rhinos, 1 big male Water Buffalo and 3 to 4 Wild Boar. The road on the damm that grants access to the area afoot. 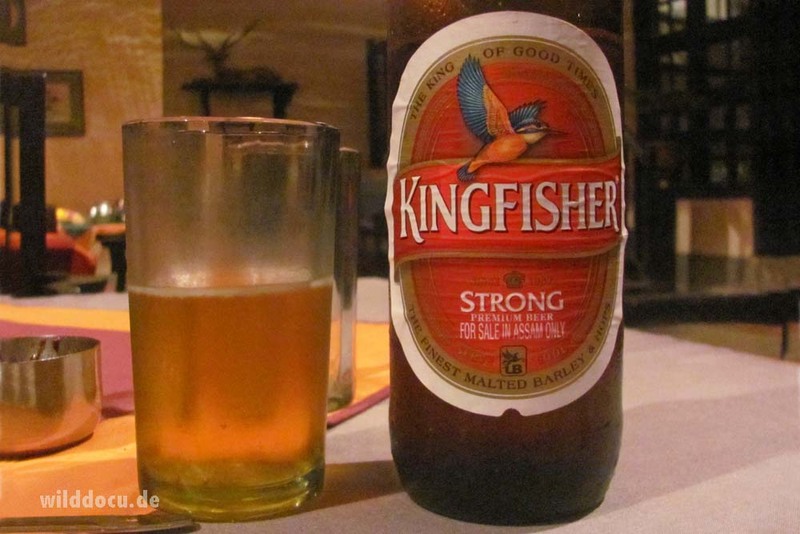 After breakfast we start at 11 am and drive until 5 pm to reach Kaziranga Nationalpark. 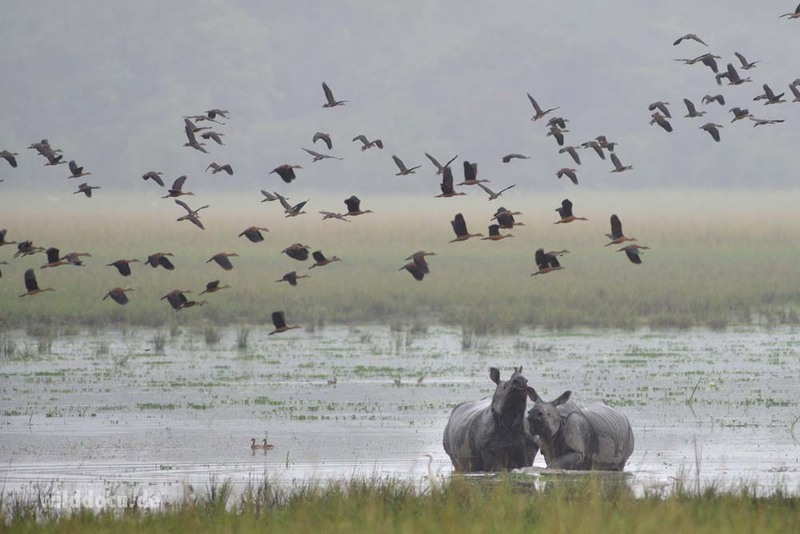 At Kaziranga it is too late for a safari. We just stop at a few lookouts alongside the main road. 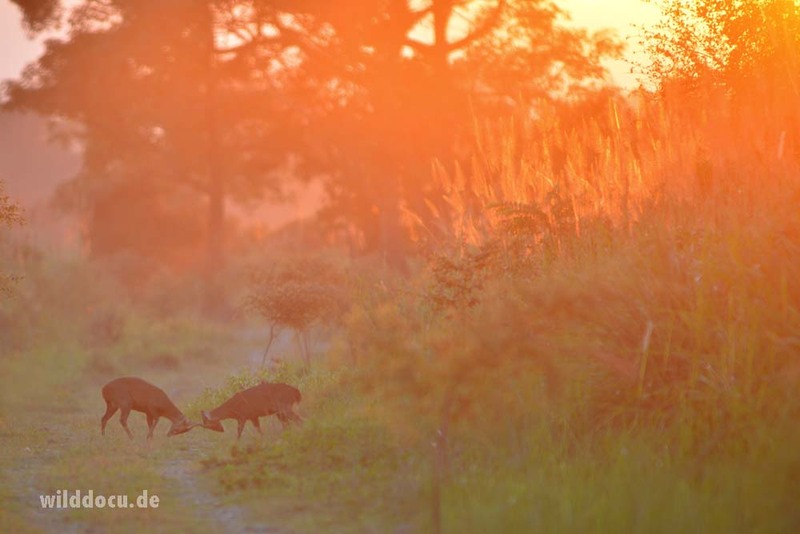 We see 3 Asian Elephants and around 10 Hog Deer. Like last year I stay at Wild Grass Resort for the night. At 4.30 am I am up for a walk throuh the garden. I observe 2 Hoary-Bellied Himalayan Squirrel, Oriental Magpie Robins, Scaly-Breasted Munias and listen to the nice calls of a Black-Hooded Oriole. At 8 am we start to a long ride to Guijan. A highlight on the trip are the Purple Swamphen at a site near Sivasagar. On arrival in Guijan at arround 4 pm I have a kind of mammal watching experience, that usualy does not even happen in bad documentaries. – But I have to go afield here: There are two reasons to come to Guijan / Maguri Bill / Dibru Saikhova Nationalpark. There are Fishing Cats at Maguri Bill. 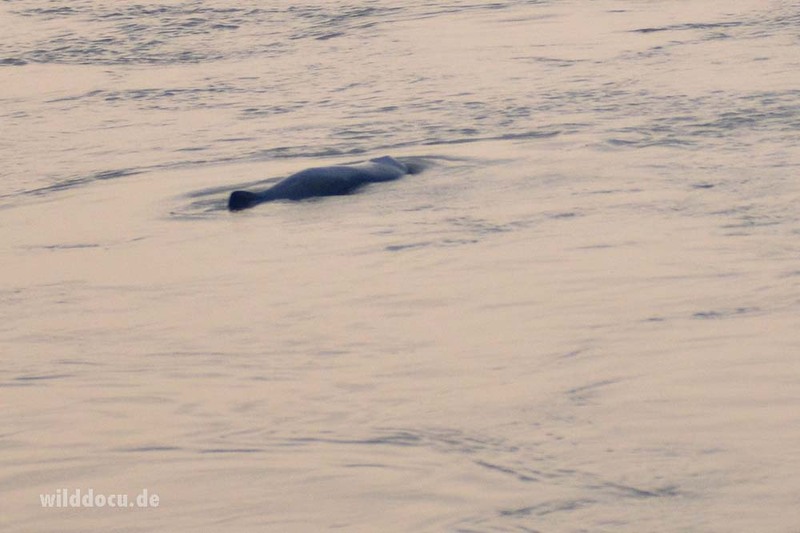 And there is a chance to get a glimpse of the Ganges River Dolphin in the waters around Dibru Saikhova. So imagine: After an 8-hour, rather uneventful trip I get off the car to stand on the banks of the mighty, gently flowing Bramaputra. My views go over this wast stretch of water, to the distant mountains, down the river towards the west and eventually down to the little eddies in front of me. And there it is: the dolphin. So virtually it has not taken 5 seconds to look for this „one of the most threatened cetaceans in the world“ (dolphins-world.com). And within the next 15 minutes we see it surface 4 more times. That’s good luck! 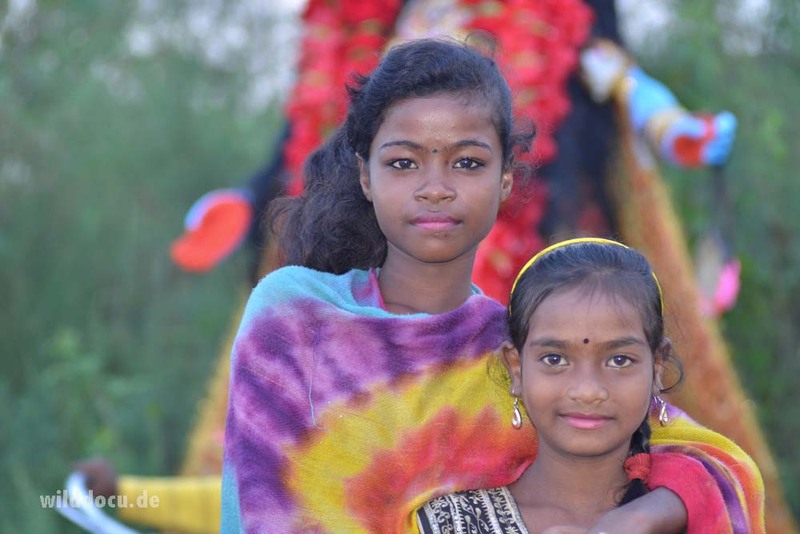 Two Assamese girls watching me watching dolphins. Our accomodation for the night is the Bonashree Eco Camp just around the corner. 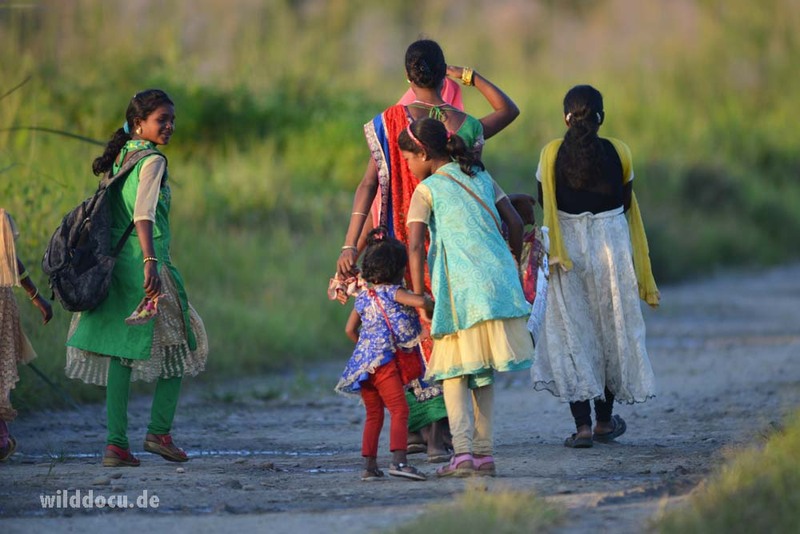 In the morning I go on a walk through Maguri Bill, just 20 minutes from the Bonashree Eco Camp. 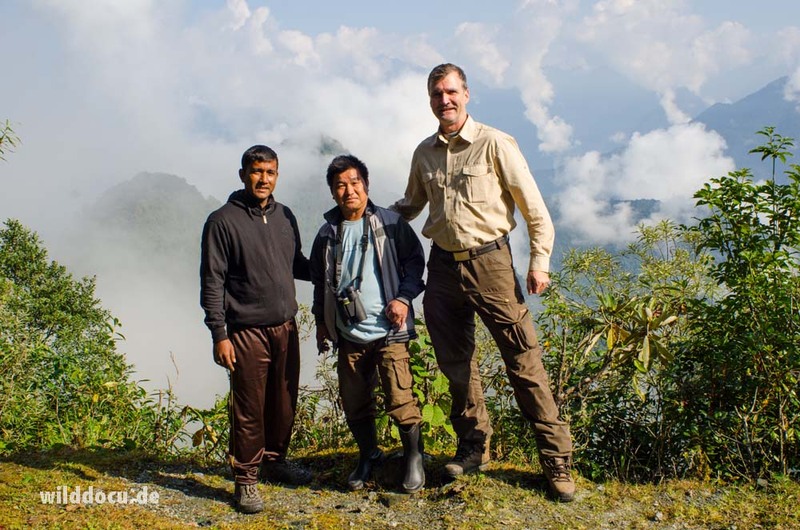 A local guide – his name is Prabia – accompanies me from 6 – 8 am. Some of the birds he shows me are a Pied Harrier, Cotton-Pygmie Geese, Chesnut-Capped Babbler, Dusky Warbler, White-tailed Rubythroat and Black-Headed Gull. Rain forces us to go back. I decide to save the Fishing Cat for the return trip. After breakfast we start on the 3-hours-trip to Roing. Until last year it was quite an adventure to cross the Lohit River before Roing in a small ferry. Now, in spring 2017, the Dhola-Sadia bridge, India’s longest bridge, has opened, which saves you 3 to 4 hours travel time. 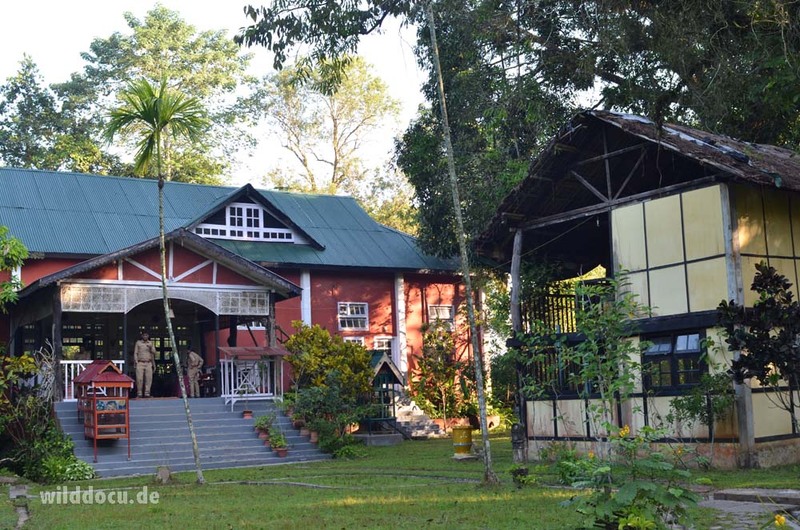 We check in at the Mishmi Eco Camp, nicely situated at the outskirts of Roing (population: 11.000) and then visit Roing Minizoo (just a Leopard Cat, Barking Deer and Muntjaks from the area are of interest for me – and there isn’t much more). We go for a walk around Sally Lake. The artificial lake is a kind of leisure park, where locals go making circles in little plastic boats. Its not really what you expect when you have lowland subtropical rainforest on your agenda. The reason why most birding groups visit the lake might be that it is one of the few places, where you get easy access to the forest. Without a concrete path or a road the leech-invested area is basically impenetrable. 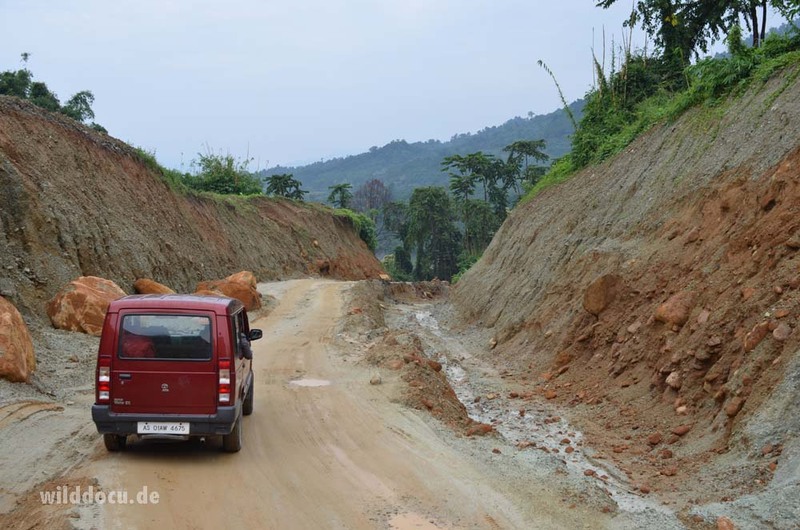 The lower sections of the Roing-Mayodia Pass scenic drive are in the process of being converted into a multilane industrial road. After some kilometers we leave the construction sites behind us. Relieve! 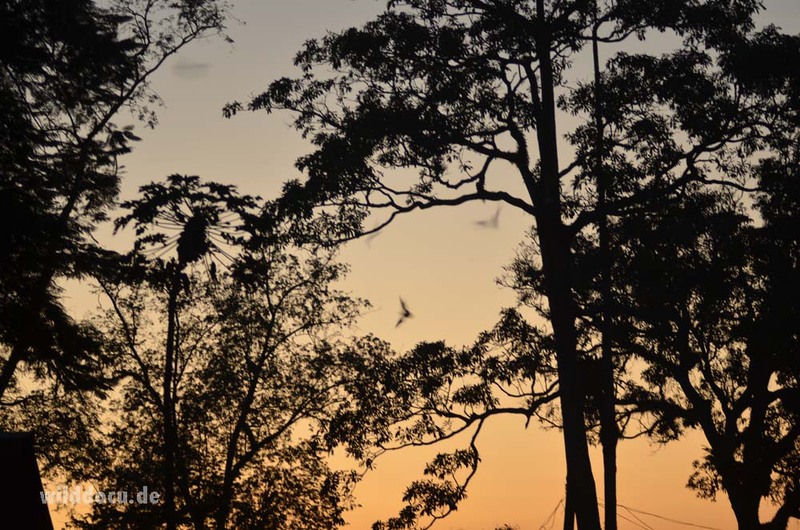 At 650 m ASL we stop at a site, that is known for its Pale-headed Woodpeckers. 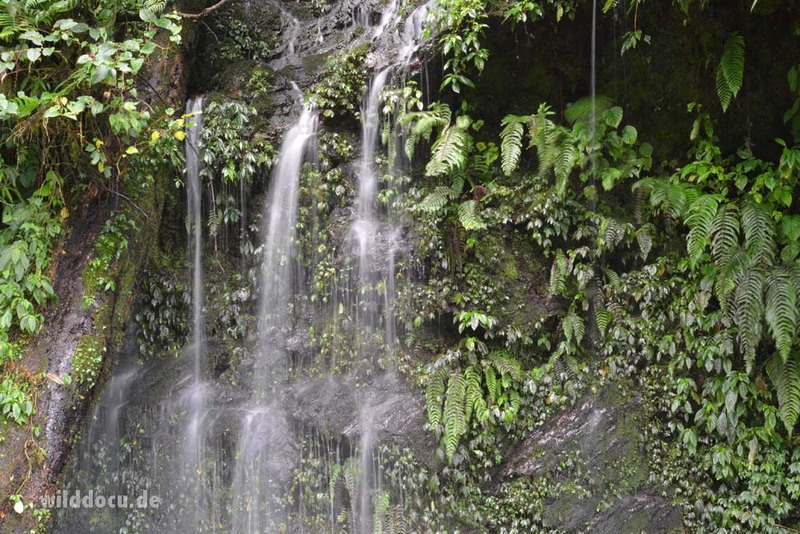 We can hear it, as well as a squirrel and two groups of Hoolock Gibbons above and below us. Very impressive! Other highlights of the day are a group of 5 flying Wreathed Hornbills at 850 m ASL and a second group of 18! 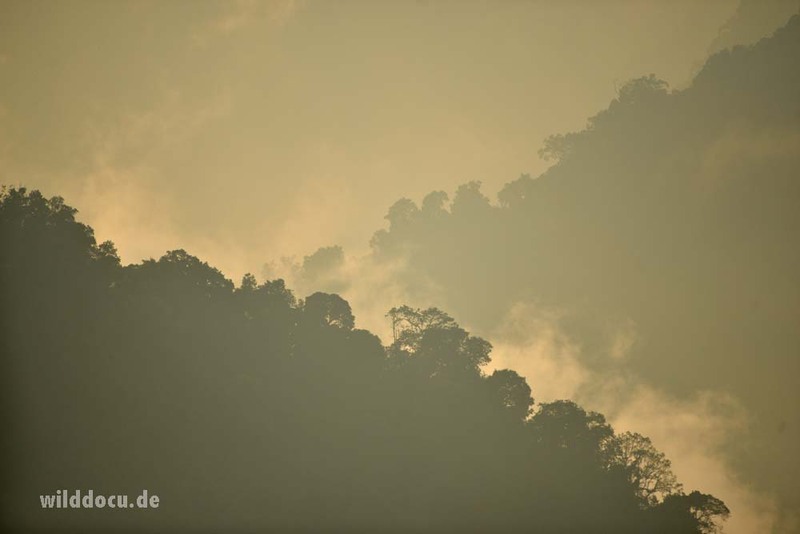 flying Wreathed Hornbills at around 1000 m ASL. 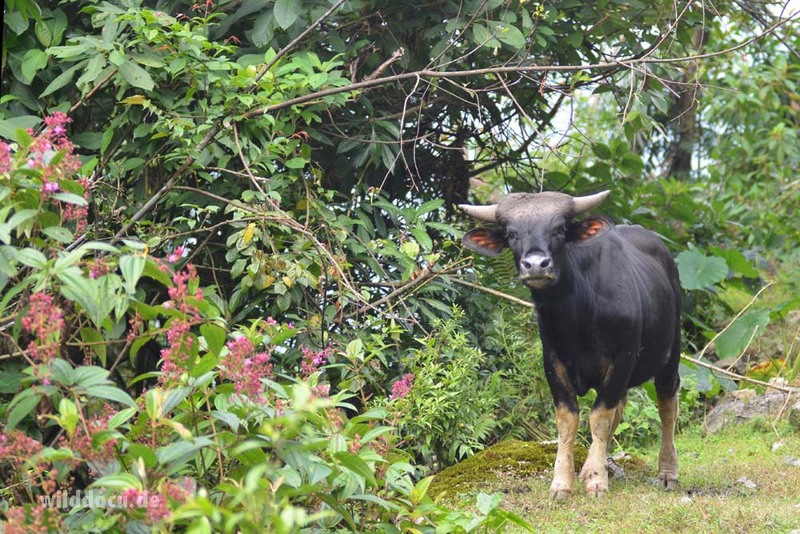 At 2500 m ASL we run in our first Mithun, the domesticated form of the Gaur. Soon after KK shouts: „Red Panda!“ In fact it is a Yellow-Throated Marten, crossing the road in front of us. The two seconds I can see it, are enough to make it my new favourite mustelid. Its brightly colored fur and the sheer size are very impressive. A few hundred meters below Mayodia Coffee House we check the first sites, where in the past goral, serow and takin had been seen. We see nothing. At 4.30 pm we reach Mayodia Coffee House at 2430 m ASL. We start at 5.30 am scanning a landslide area just behind Mayodia Pass: no monal. We see a Hoopoe, hear a Hill Partridge. Later, at 2299 m ASL we see our first Manipur Fluvettas. Drama plays back their songs and attracts 8 of them. Great show! 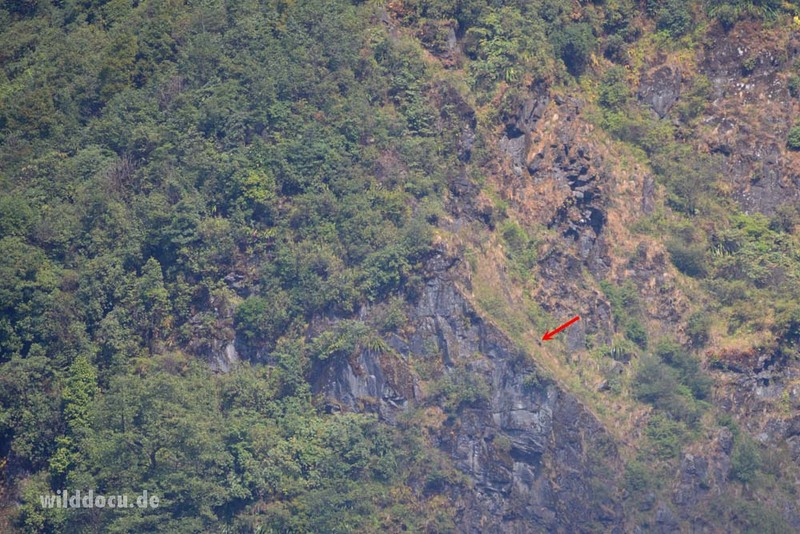 And then it just happens: We check another landslide area, look over the edge and there it poses on a ledge: a Red Goral, around 200 m down the slope. I set up my camera and tripod and start taking pictures. Great! Around noon Drama shows me a site south of the Coffee House at 2271 m where takins could be seen regularly crossing the road between June and August. Ten years ago he has seen the last ones here. At 2117 m ASL Drama points out „the Trogon site“. He plays back the song. A bird responds, but it takes a while until it shows up, shortly though, but a yellow belly is seen clearly in flight. So, it must be a female Ward’s Trogon. Again we start with checking the area north of Mayodia Pass. Fog obstructs the view at the Goral site. A niltava (species?) and a Chestnut-Bellied Thrush are nice findings. Until noon I make 7 to 8 stops to check for ungulates, but we can’t find more. But then at one site southwest of Mayodia Coffee House I scan a slope at around 2300 m ASL and find something black moving up the hill. It is too far to be clearly seen. But being very compact and by the way it moves, it can only be a bear. Takins are not that black and Mithuns don’t dare to go off the road that far, Drama tells me. Sloth Bears are known from the Lower Dibang Valley, but above 2000 m ASL I reckon it is a Himalayan Black Bear. Bingo! 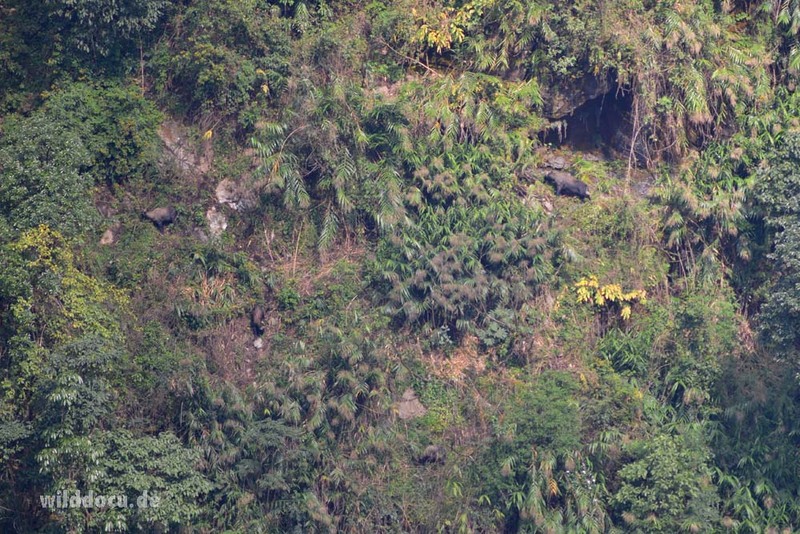 Look here for bear distribution in Arunachal Pradesh. I know, this photo is not very convincing. But in my succession of photos of this spot, you can clearly see how something black moves up the slope – a bear! A little bit down the road at 2087 mASL we check another slope at eye level. 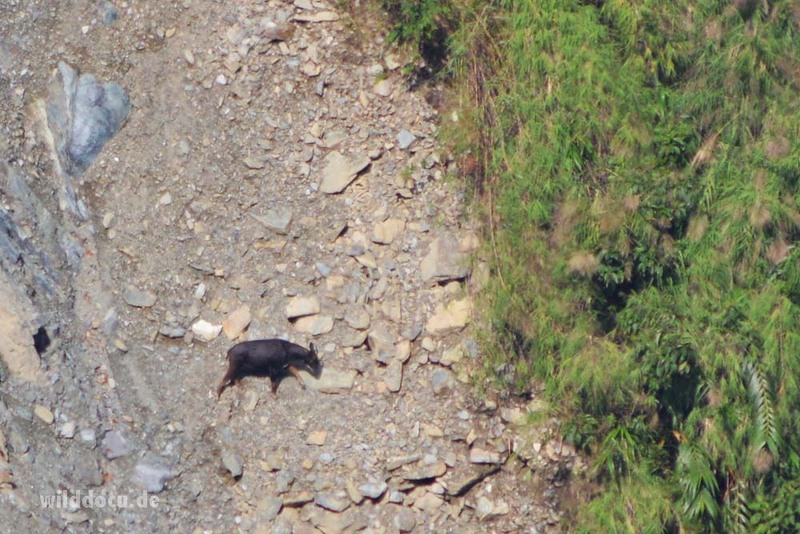 Then Drama sees it first, not across the valley, but all the way down, close to the river bed: a serow. It gives me 30 seconds, while it crosses a land slide area. We can clearly see that it does not „wear“ the white socks of the Himalayan Serow. The body is black, the limbs are chestnut red. So it is a Chinese Serow. Bingo! Bingo! And the show goes on! As soon as the serow disappears in the bush, we swing back our binoculars to the opposite valley side. And just a few minutes later I shout out the word: TAKIN! It’s actually 5 of them moving down the slope. And everything is perfect: the angle, the distance, the light. And I get, what I wanted: photos of takins in their natural habitat. Bingo! Bingo! Bingo! Now I become cocky. After having seen my target species, what else could there be today. Red Panda? Drama tells me that the last one he saw, was at Mayodia Pass ten years ago. O.k., let us be content with some birds. The afternoon brings to light a Plambeous Water Redstart, a Thickle’s Leaf Warbler and a Besra. At 4:45 am I salute a Grey Nightjar coming up the road. Until 5.40 am we join an Indian birding group to look again for monal at the pass: Again without luck. 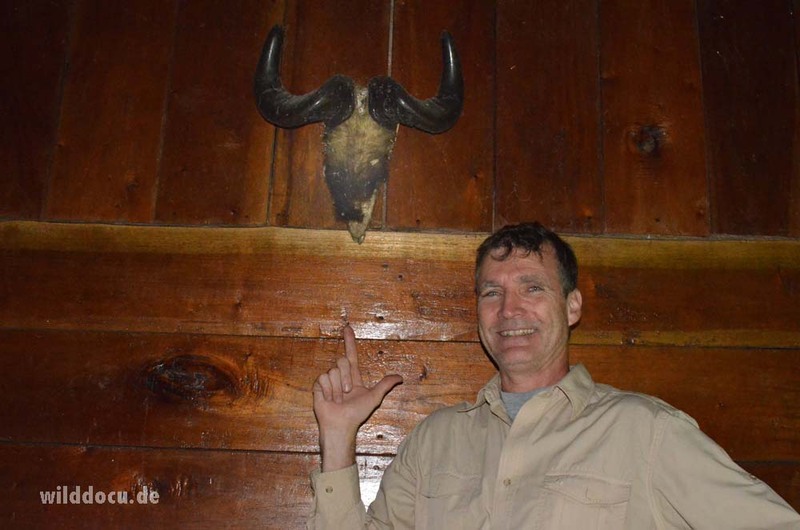 At the goral site: no luck. 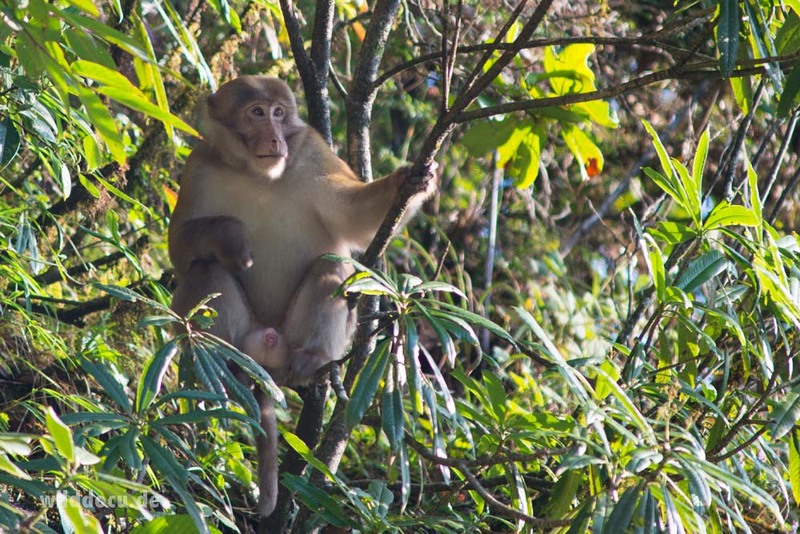 But we do have luck with a group of macaques, that we encounter on the way to Hunli. A male is not really pleased with our presence, but cool enough to pose for some moments. The Indian birders had mentioned White-Cheeked Macaque, so I was hoping for this new species. But as discribed above, at home it turns out to be Assamese Macaque. 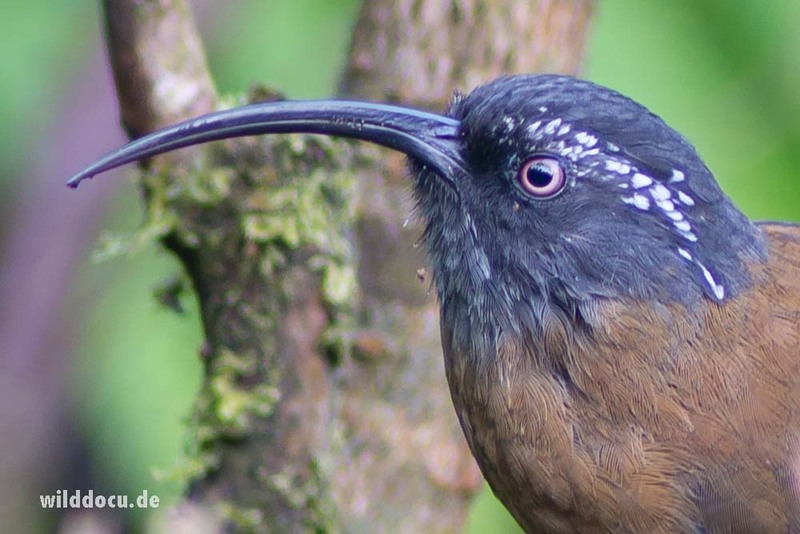 Birds of the day are Pale-Capped Pigeon, Green-Tailed Sunbird and a Slender-Billed Scimitar Babbler. We check in at the comfortable Circuit House in Hunli and proceed. The idea is to explore the Ithun River downstream and a landslide area at 28.401978, 95.915670. But we realise that we have come down to 550 m ASL. It is hot, and we figure too hot for goral. But the area is good for birds like Black-Chinned Yuhina, Green Magpie and Blue-Winged Siva. The day starts good at 5 am with a Spotted Forktail, good views of a Streaked Spiderhunter and a Collared Owlet, that we call in. We are on the way back to Mayodia Coffee House. We see another group of macaques, but don’t really get good views. At the goral point we are more sucessful. This time we see 5! animals: a male, a female with a yearling and a female with a young of the year. This is promising! We have breakfast at „65“, a little restaurant at kilometer 65. Then we bird our way up again – with lots of Yuhinas, a Beautiful Sibia and a Streak-Throated Barwing. We check the Takin site again: nothing. We take a break from noon til 6.30 pm. Then we start again for a night drive and dinner at „65“. It starts great with a Brown Wood Owl and a Grey Nightjar. On the way down we seem to be too early for the squirrels. 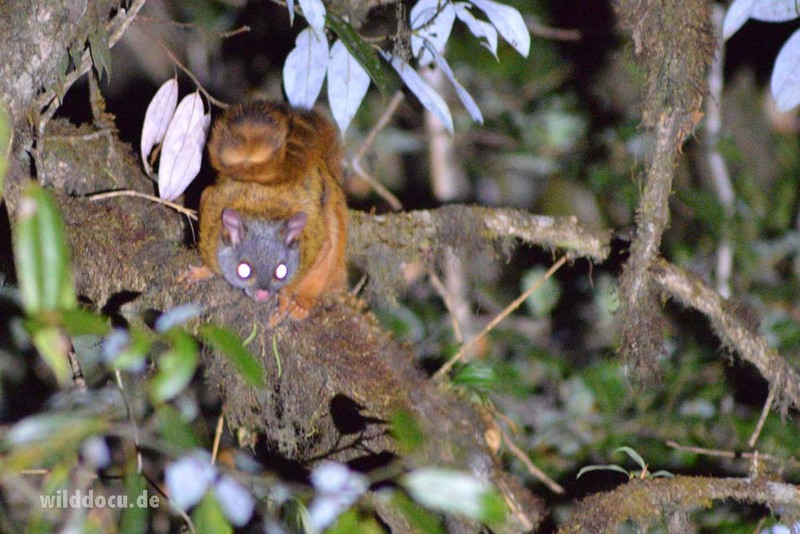 However on the way up we are lucky and get 2 Grey-Headed Giant Flying Squirrels. On the way back to Roing I get my first decent looks of a diurnal squirrel, of which we had so many on this trip, but mostly could only hear them. It is a Pallas Squirrel. It climbs to a pumpkin-like fruit, that the Idu-Mishmi people call „Deapu“, Drama tells me. I take notice of a tree at 1431 mASL. 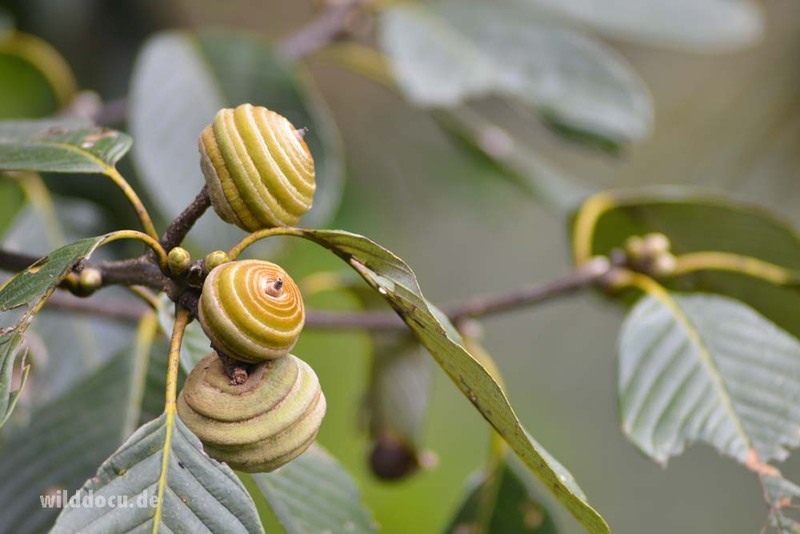 It bears fig-like fruit, which smell sweet. 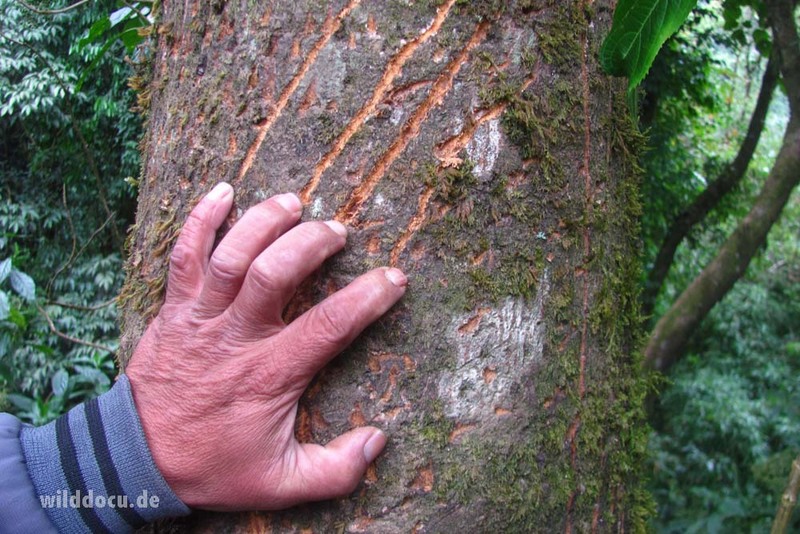 We have a closer look and find scratches on the bark, chewed up fruit and scats. We have no doubt that a bear was here quite recently. It takes a second to come up with a plan: We travel further down, have a late lunch at Tiwariagon, a little village on the way to Roing, come back and wait for the bear at night. 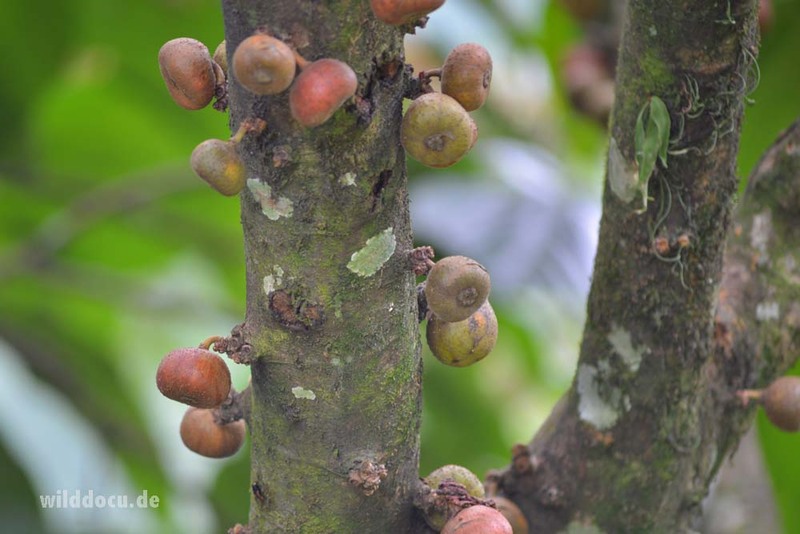 The setting is just perfect: The „fig tree“ is next to the road; we can park the car in a bay 50 meters away from the tree; the canopy is open to the side, where we want to stay and the wind is in our favour too. … and apparently that of bears too. The afternoon presents us a flock of quite curious Himalayan Cutias, two noisy hornbills in a tree overhead and a fantastic Green-Tailed Sunbird. At 4.30 pm we are back at the bear site. Unfortunately it begins to drizzle. Soon we are befogged too. Never mind, it is still early. But what can you do? Sleep. It takes only seconds and Drama in the back snores like a sun bear gnawing a honey-coated branch. The hours go by and the weather changes for the worse. Suddenly Drama gets up and leaves the car without saying anything. Is he cheesed off with us because we kick him all the time to prevent him from snoring? Well, KK and I discuss how to proceed. Fact is: the fog is now so dense, we can’t see anything, so we decide to give up. I pack my camera in the trunk and slam the door to give Drama a sign. He returns to tell us that a noise behind us had made him leave the car. His flashlight then startled a bear in another tree, that we were not aware of before. Holy Baloo! We should have checked the site to find more signs to get a definite proof what species it was. But we skip that and just put another „bear“ on the list. Later I find out that it can only be a Himalayan Black Bear. No more nocturnal creatures on the way down. We arrive late at Mishmi Hill Camp, Roing. 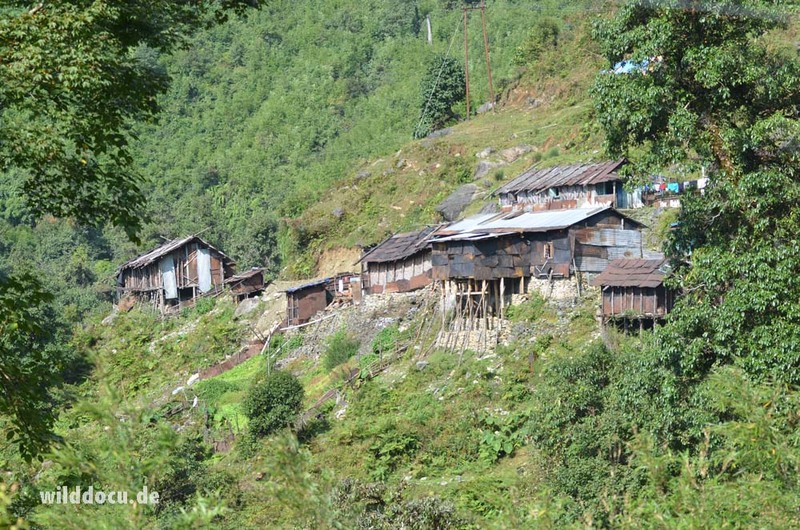 This is it: one week in the Mishmi Hills. One of my best trips ever! The future of large tracts of the Mishmi Hill forest look sinister: The planned Dibang River dam alone is estimated to submerge 5000 hectares of land. We meet again in the morning to look for Black-Breasted Parrotbills at a riparian site near Idili, 20 kilometers southwest of Roing. It works perfectly. Now we dance hilariously in the reeds, knowing that a succesful stage comes to an end. We drive back to Roing, get some money and say goodbye to Drama, who was good company. After a three-hours-drive we are back at Maguri Bill. I go for a walk by myself to find a Black-Winged Kite and a pair of Amur Falcon. Later Probin, the local guide, tells me that my photos of the falcons are the first ones of the species taken at Maguri Bill. In the evening we give the Fishing Cat a try. My driver KK, Probin, a fisherman and I embark a „nao“, how the local barges are called. Silently we glide on the water, last lapwings call, voices from the nearby village make for a peaceful atmosphere. As soon as it is dark, I switch on my headlamp and illuminate the banks. Nothing really shows up, except for a Pied Kingfisher, but I still enjoy the trip very much. Eventually we reach a cutoff branch of the river, that is accessible via a narrow, 30 meter long channel. 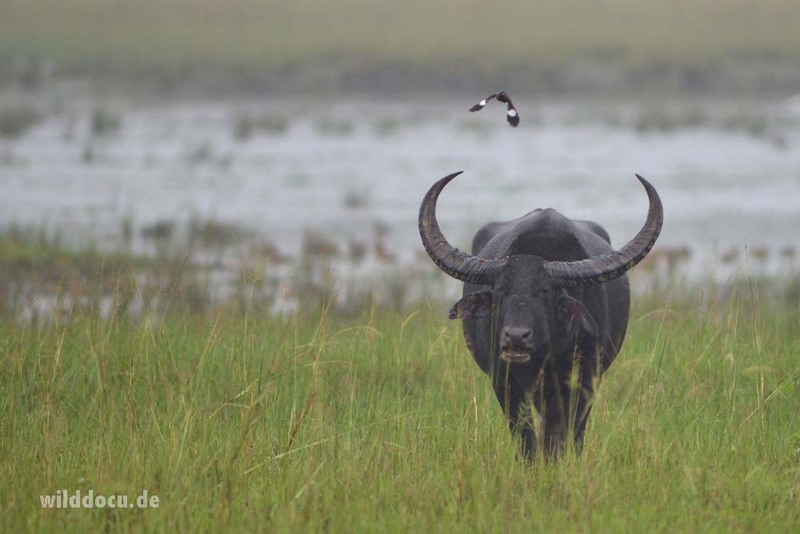 But on arrival we startle a group of Wild Buffalos, which then hide in the nearby reeds. We stay in our nao and wait. The buffalos seem to be quite nervous, but on the other hand they don’t make a move to leave the area. With the buffalos being so close (20 m), we mustn’t dare to go through the channel. We would be trapped, if they attacked. So we wait some more time and eventually leave the place. We check another site, land and climb up the banks. But as soon as we reach the top, we have to withdraw: buffalos again. Holy bull! But it is o.k. A Fishing Cat would have been a nice bonus. But I can survive without it. We call it a day and paddle back. But a little, feathery bonus has to be! So, in the village Probin calls in an Oriental Scops Owl. Wunderbar! 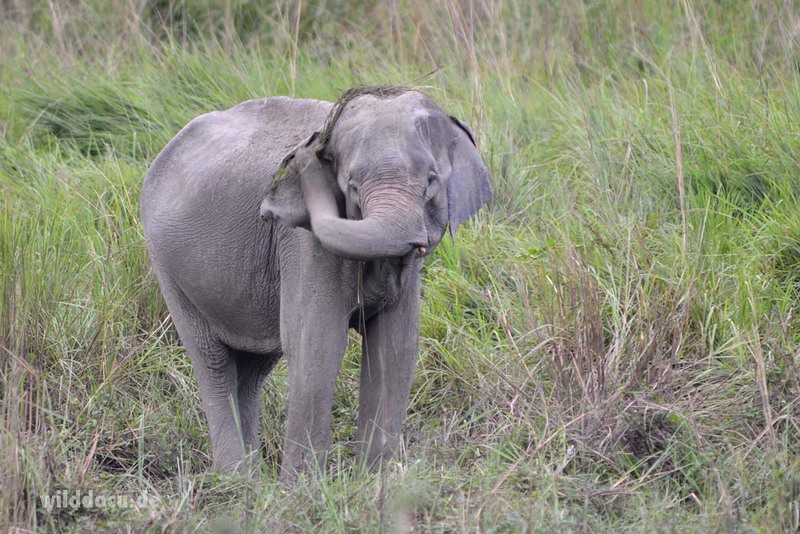 Back at Kaziranga. Back at Wild Grass Resort. Back in paradies: A mixed flock of 400! 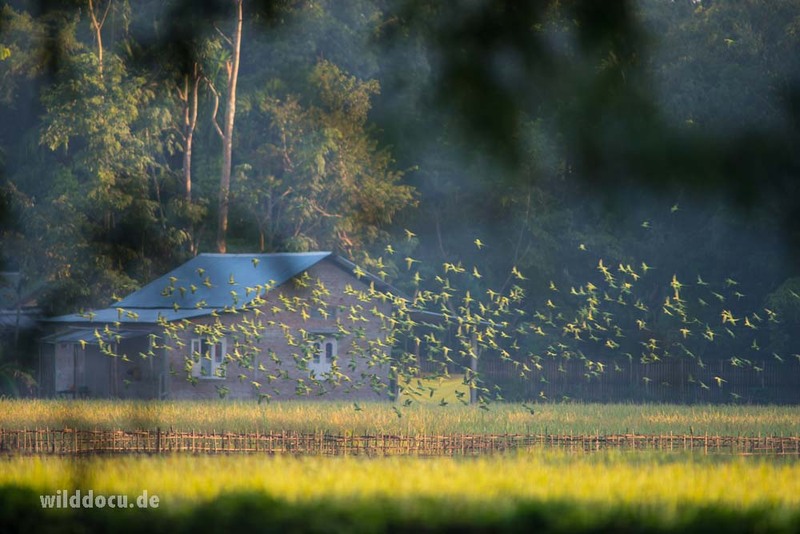 Rose-Ringed- and Alexandrine Parakeets crowds the surrounding fields – and I find nobody who complains about the damage they make in the rice paddies. That’s the way it is, people say. Parakeets in the paddy fields. What a sight! From 7.30 to 11 am I go on Safari in the Central Range, from 2 to 5 pm I drive through the Western Range. By minutes I miss my first tiger. The Eastern Range is still closed due to high water levels. The next day I change the succession, first western, then central part – to experience the two parts under altering light conditions. 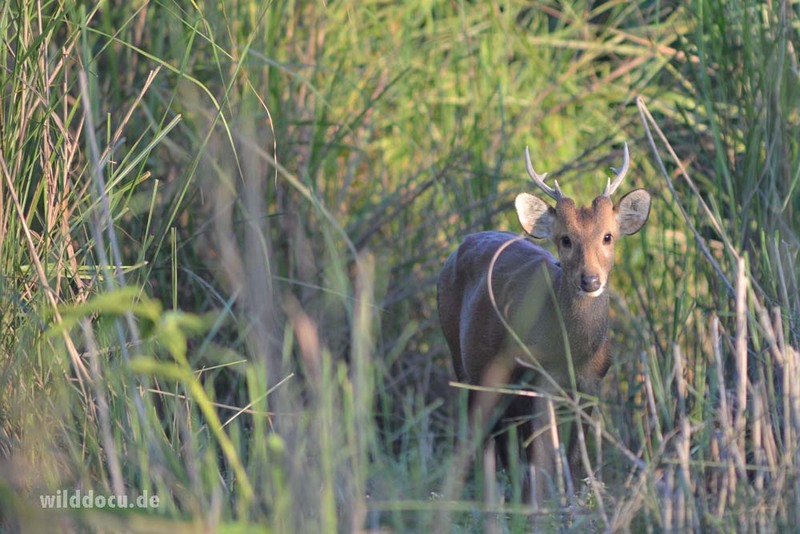 – The days at Kaziranga are a great finish of an outstanding trip! 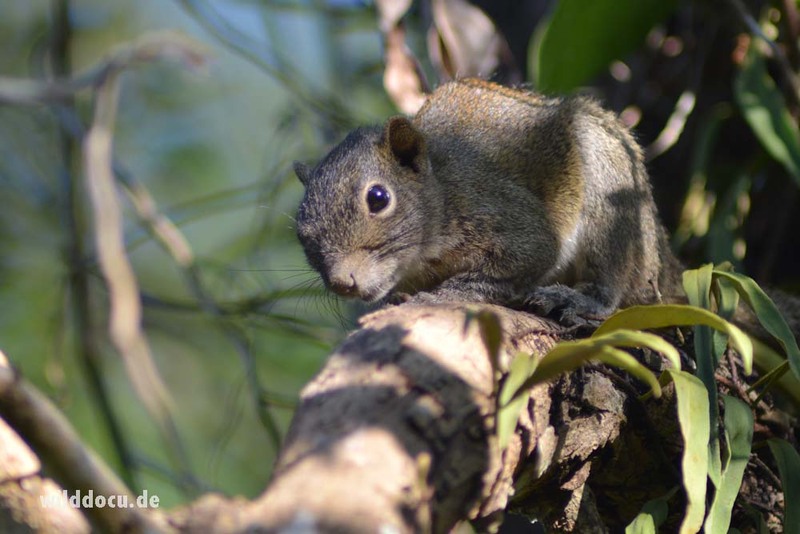 The Hoary-Bellied Squirrel has whitish underparts. At the end of the monsoon, when the vegetation is lush and dense, this is the moment everybody is waiting for: a Rhino crossing the road. Standing in the open! Especially when seen from the back the german term „Panzernashorn“ makes sense, meaning „Carapaced Rhino“. Indian tourists enjoying their wildlife. Engelbrektsson, P. & Kennerley, R. 2016. Petaurista mishmiensis. The IUCN Red List of Threatened Species 2016: e.T45959040A45973151. http://dx.doi.org/10.2305/IUCN.UK.2016-3.RLTS.T45959040A45973151.en. Downloaded on 20 November 2017.